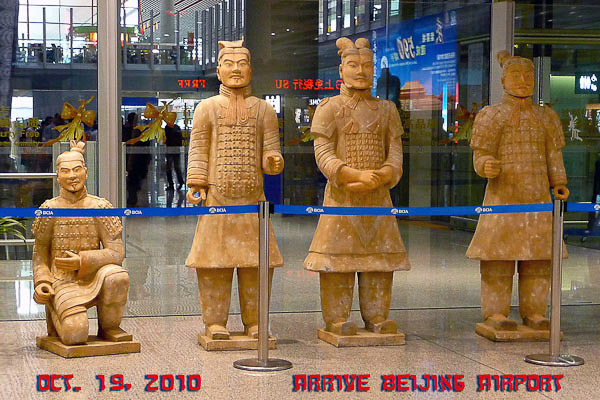 Terra Cotta soldiers at Beijing Airport preview the trip to come. First class all the way and has really great breakfasts! 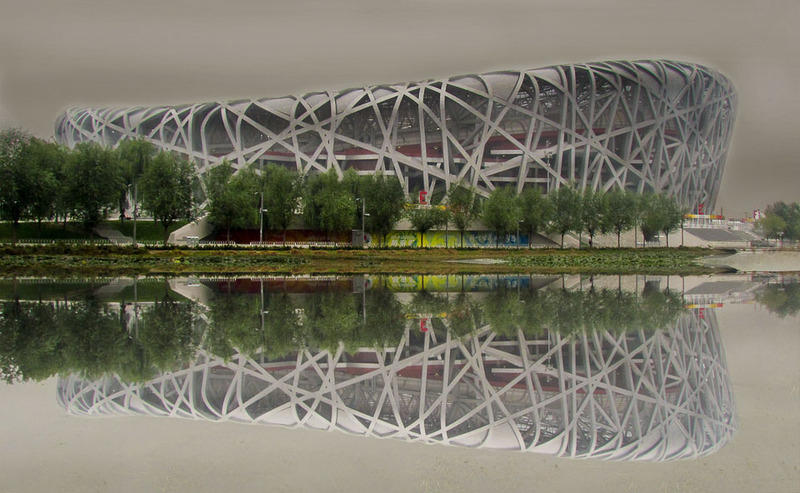 The stadium built for the 2008 Olympics is known as the "Bird's Nest". 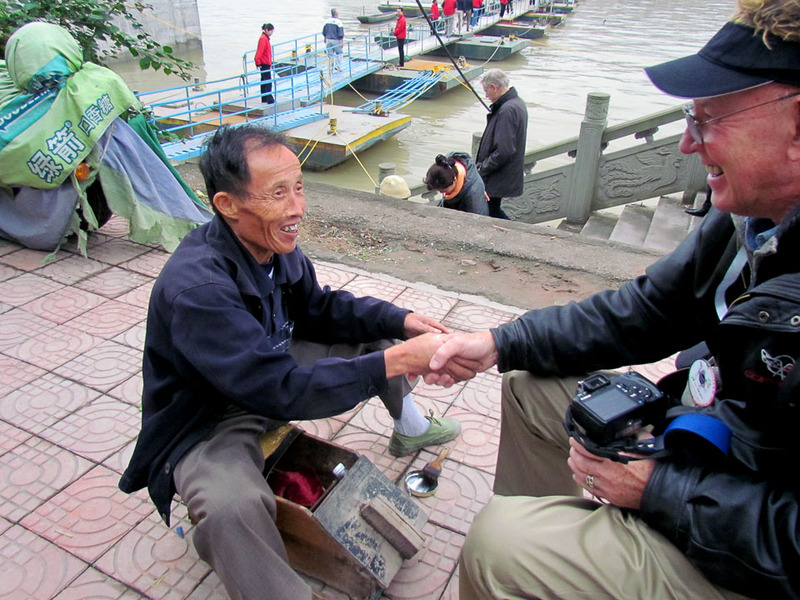 Our tour director, Peter Wong, gives lessons in the art of bargaining. 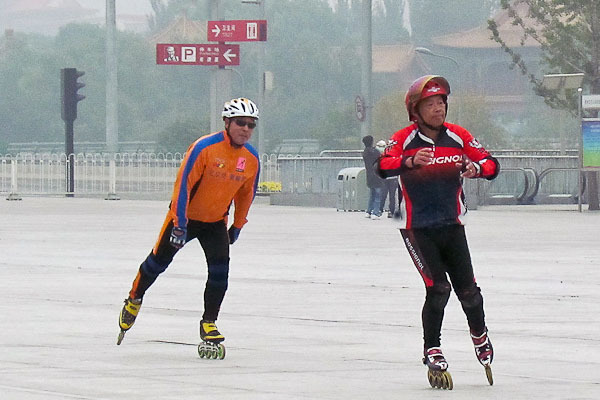 Big expanses of smooth concrete by the stadium are ideal for skating. 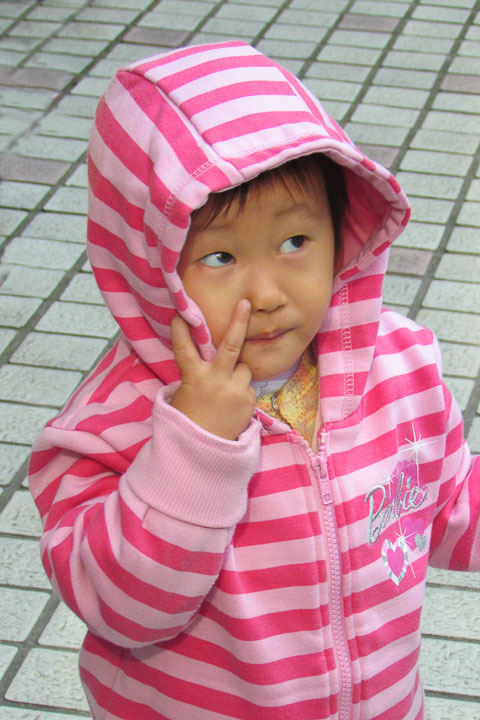 I get the first of many peace signs on our trip While taking my photo. 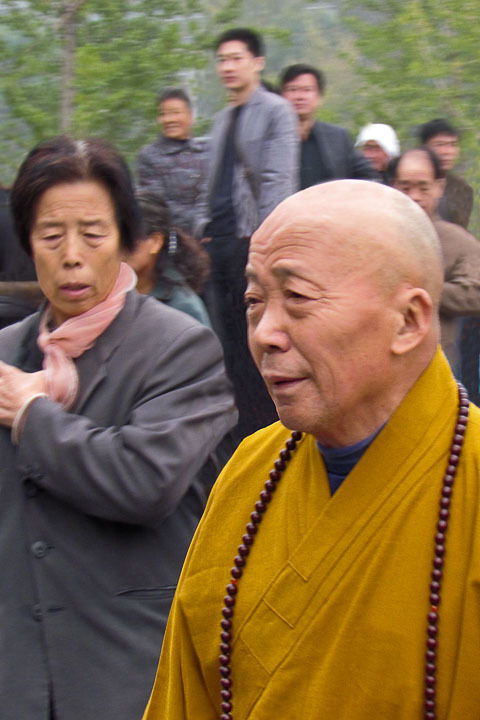 The monk's yellow robe is considered a sign of auspiciousness and spirituality. 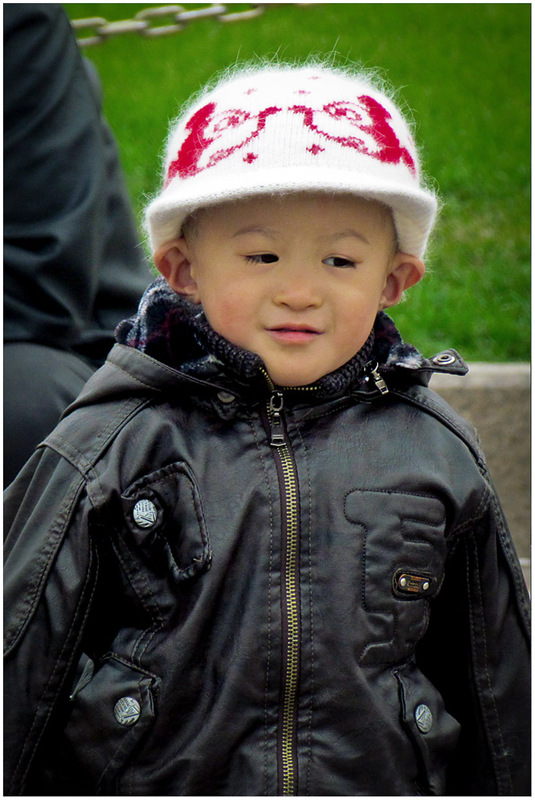 This young man will witness many changes to come in his country. 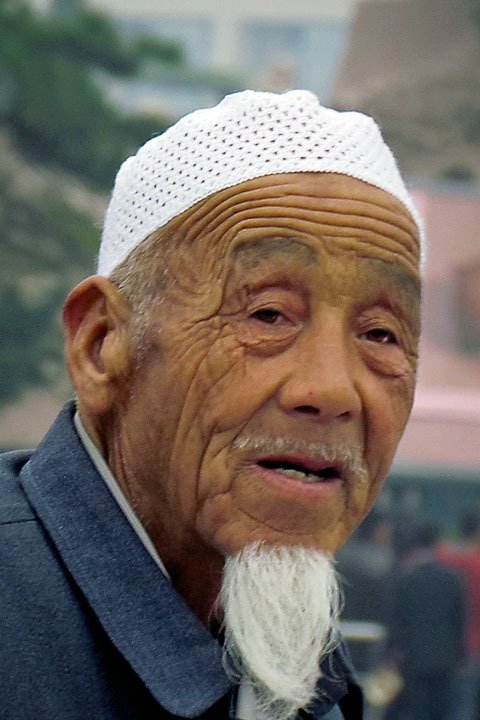 This old man remembers and represents China's past. 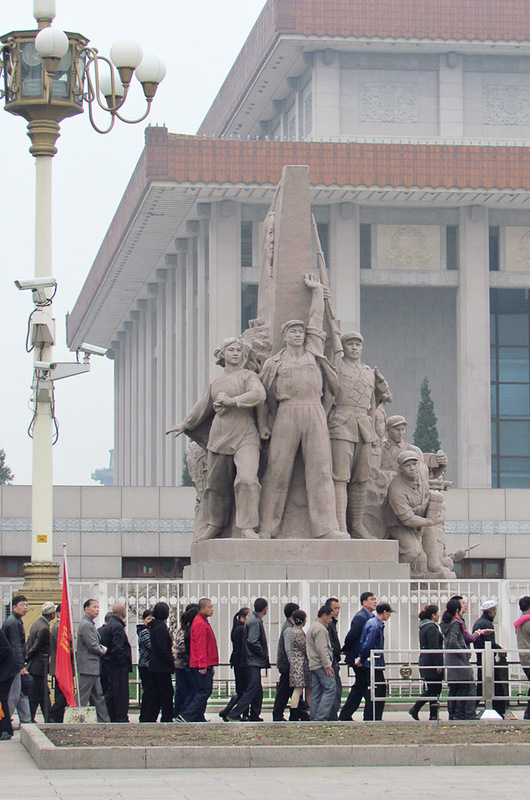 Visitors patiently wait to see an exhibit of China's country's history. 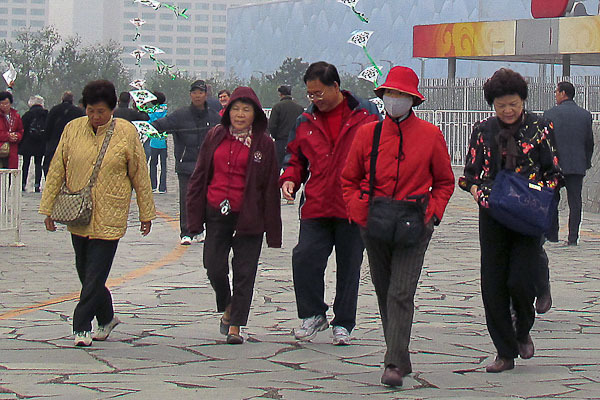 In spite of smoggy, unpleasant air, we saw few masks being worn. 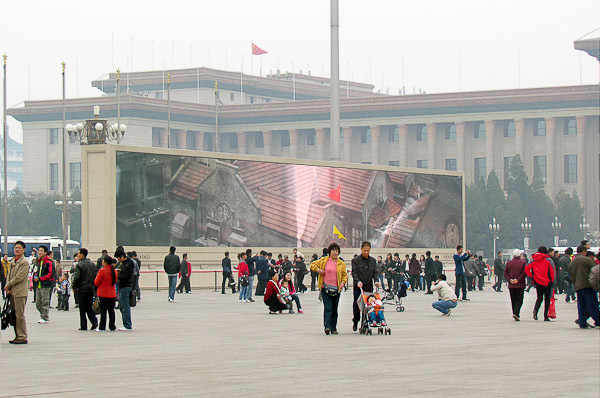 The electronic billboard presentation is meant to arouse feelings of Chinese pride. 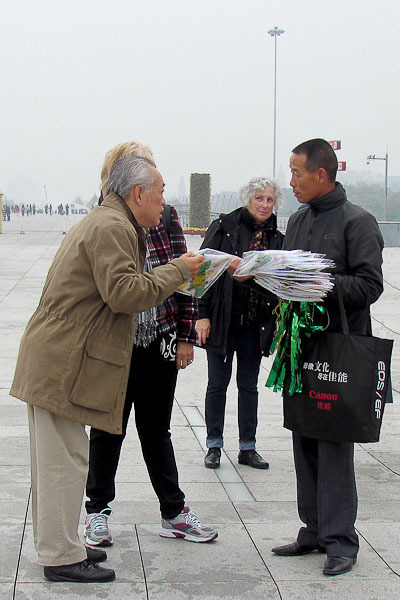 Visiting at the Tianamen Square can really tire a person out. 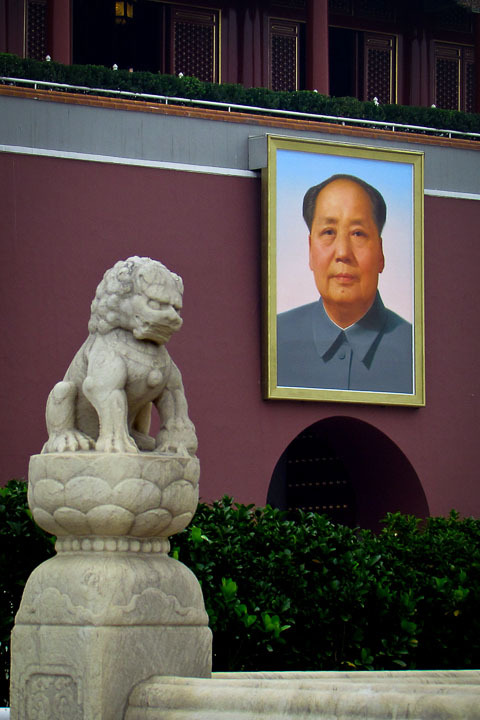 Perhaps this lion at the Forbidden City protects the memory of Mao. 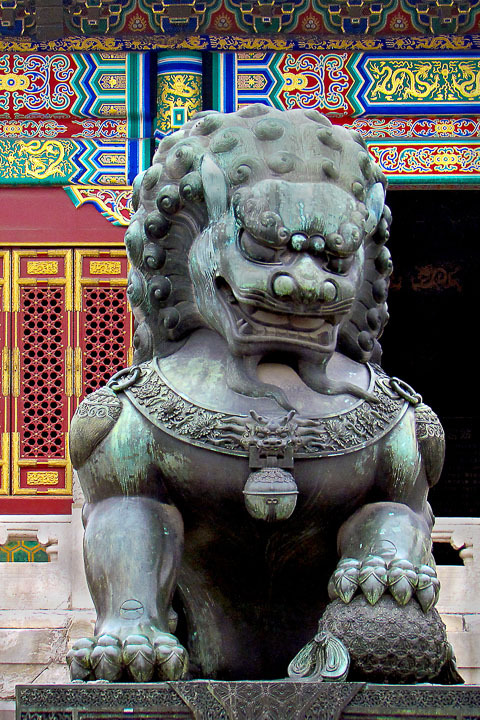 The Chinese consider the lion as a symbolic guardian and protector. 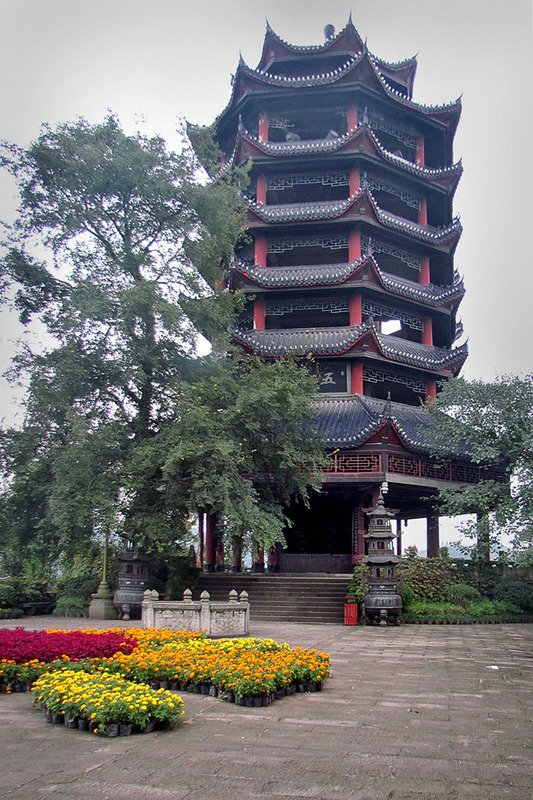 One of many ancient temples built during the Ming dynasty. 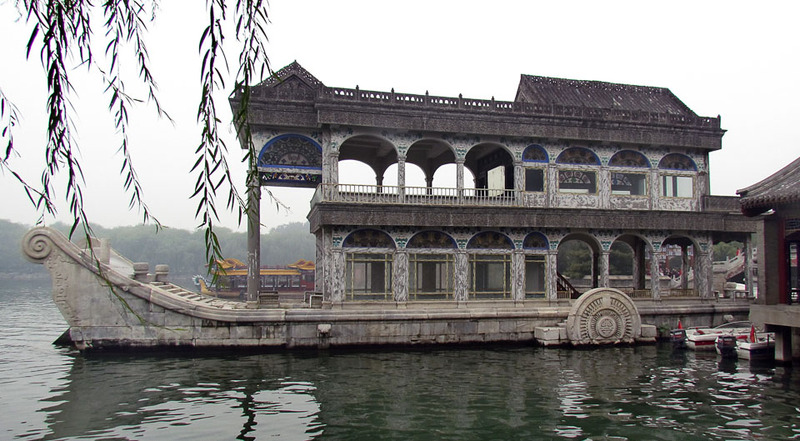 The largest surviving palace complex in the world was completed in 1420. 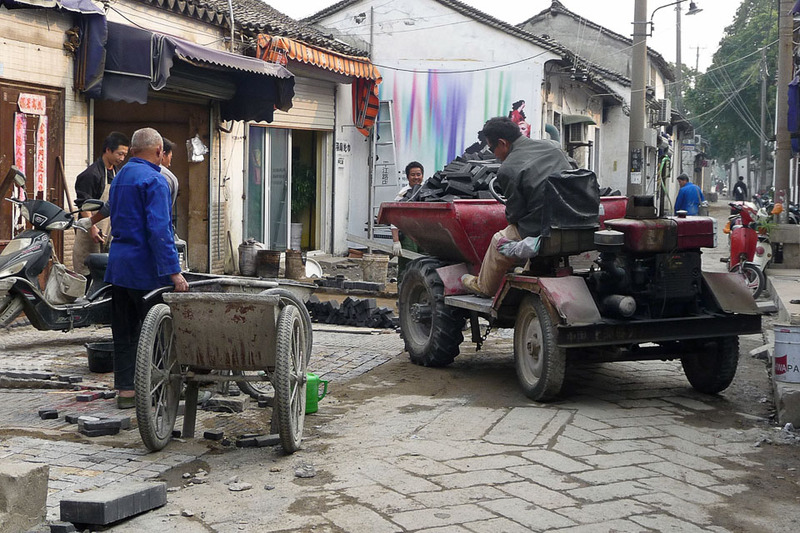 The cities we saw were super clean giving many workers employment. 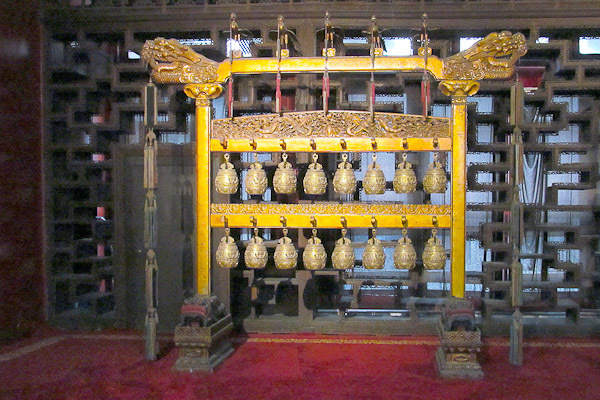 Bbronze temple bells produce harmonious clatter known as Shao music. 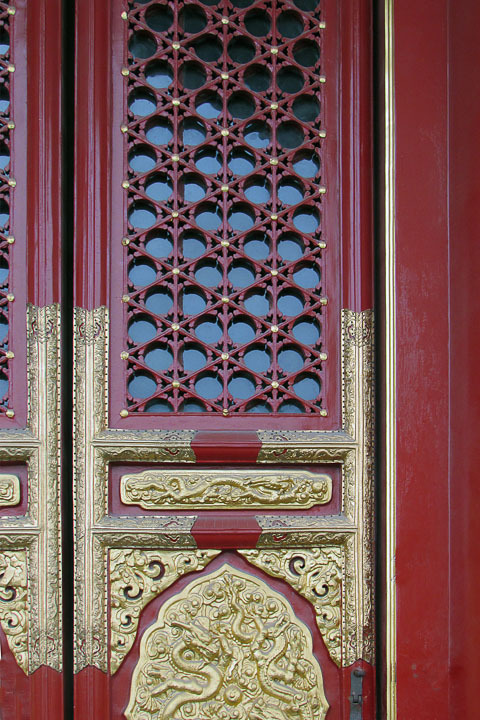 It's painted bright red symbolizing happiness and adorned with gold. 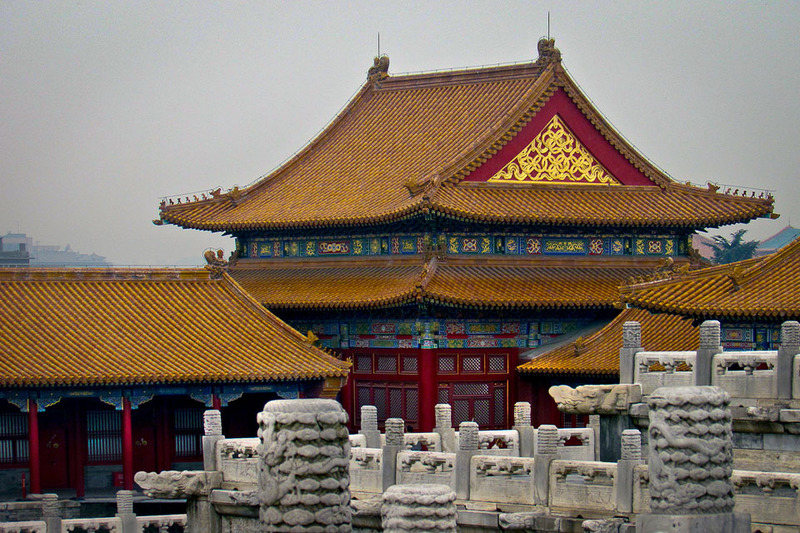 The Palace Museum offers a look at 5,000 yrs. of Chinese art and traditon. 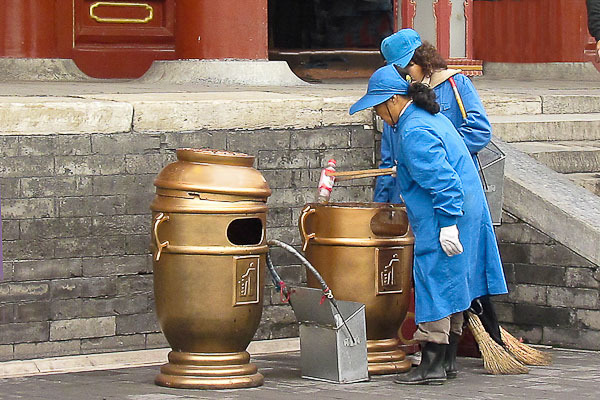 The Forbidden City is meticulously maintained by many workers. 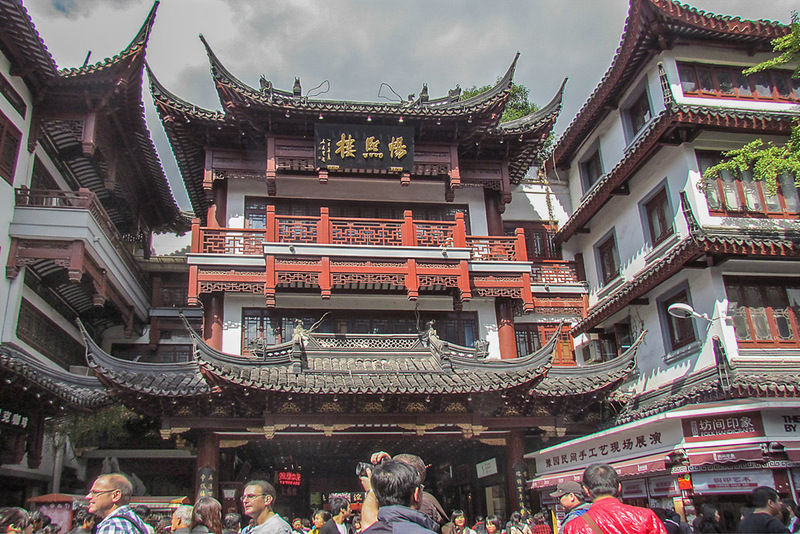 Built in 1420 by Ming emperor Yongle for emperors to make offerings and prayers. 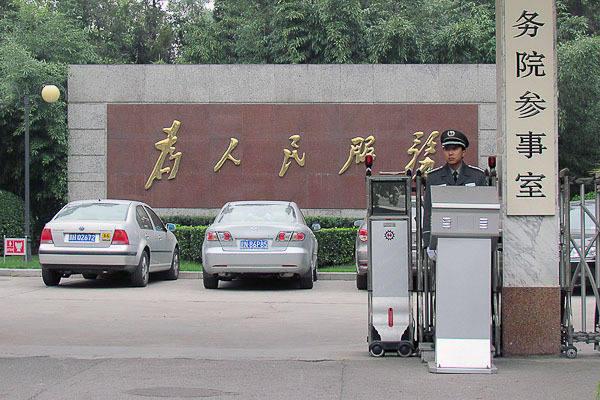 You need to have the proper credentials to be able to park here. 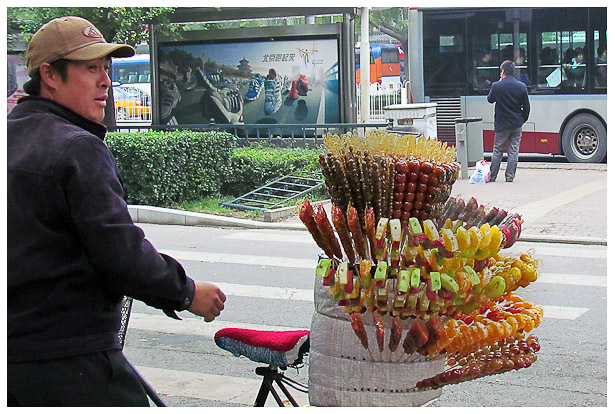 Some very different looking sweets sold from his bicycle. 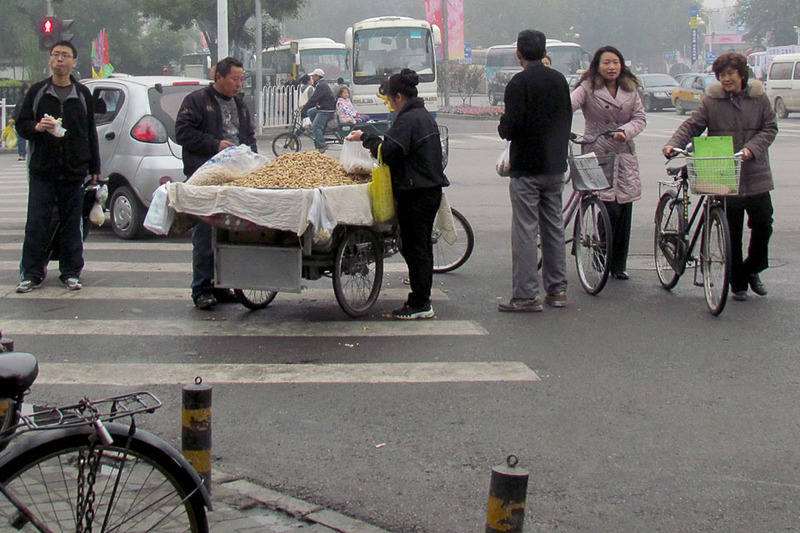 Vendors set up right in the middle of busy Beijing streets. 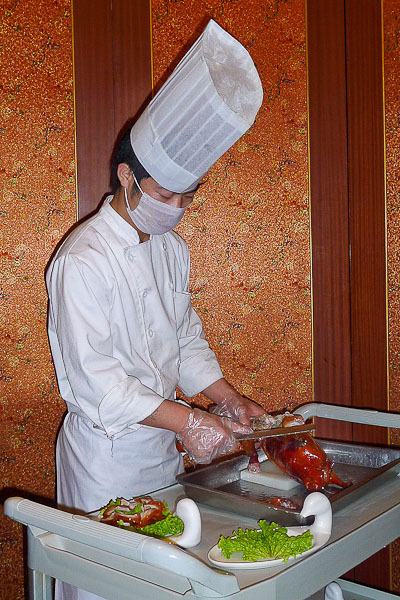 A hotel chef prepares our dinner in our group's private dining room. 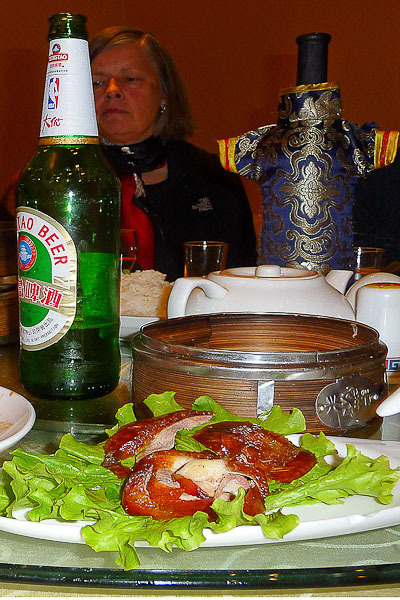 It is the traditional and delicious Beijing Duck when you are in this city. 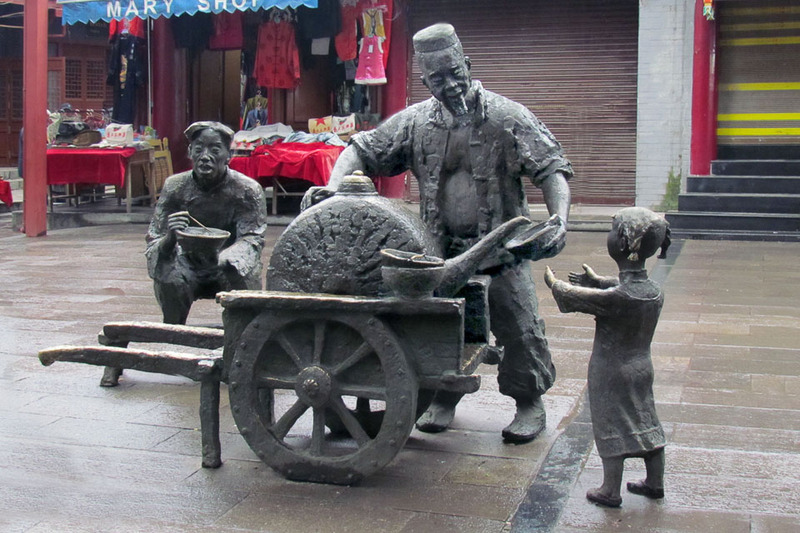 Looks like he'd rather be some where else rather than working in the market. 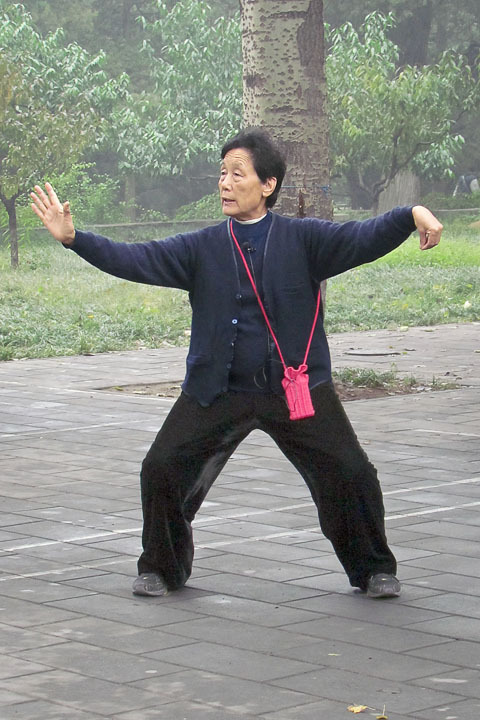 Exercise in the park is a way to socialize for high rise dwellers who rarely see their neighbors. Hat hair removal caused many smiles, peace signs and thumbs up. 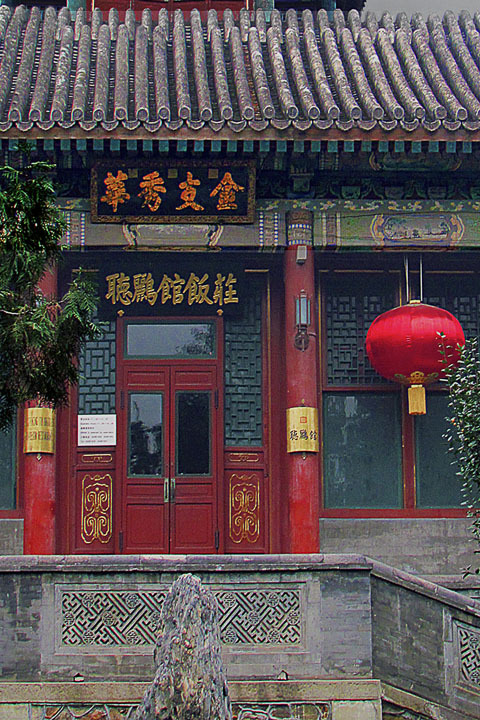 Built in 1775 by Emperor Qianlong and restored 100 years later by Empress Cixi. 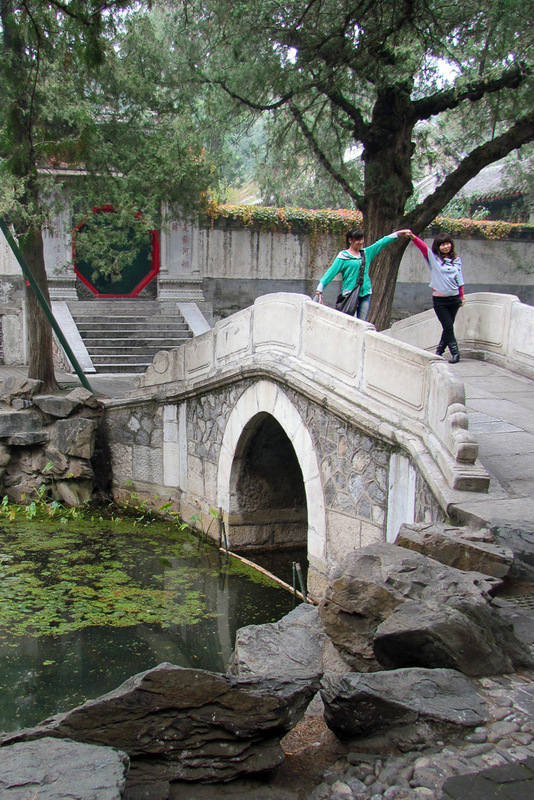 The girls are in a playful mood during their visit to the palace. 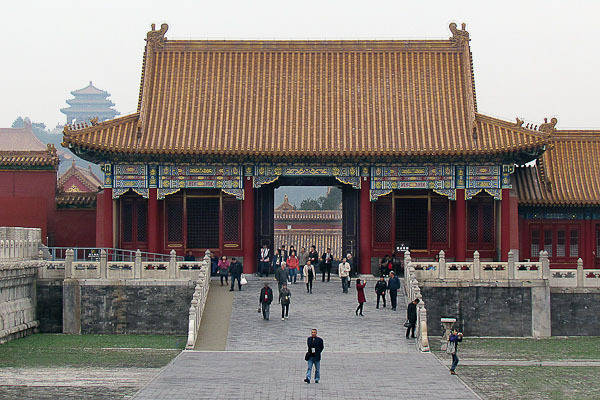 The Empress Cixi is said to have embezzled funds to use for work on the palace. 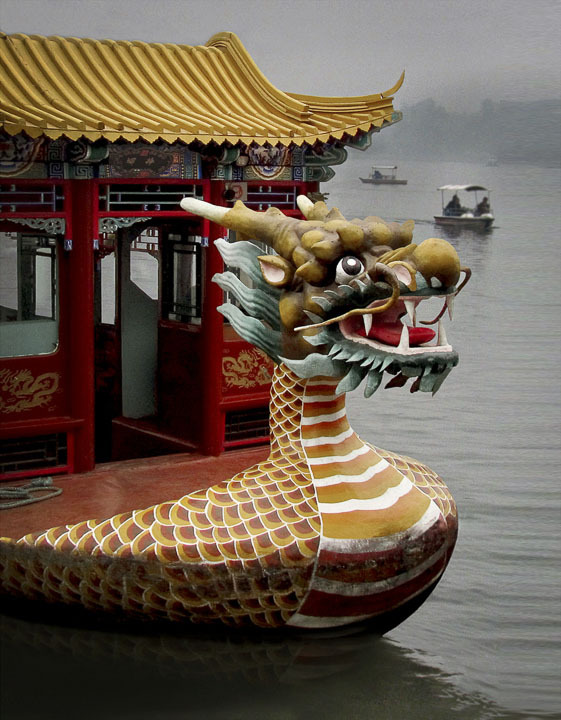 The colorful boat ferries passengers across the lake at the Summer Palace. They usually sleep between passengers but today a tourist with hat hair has them laughing. 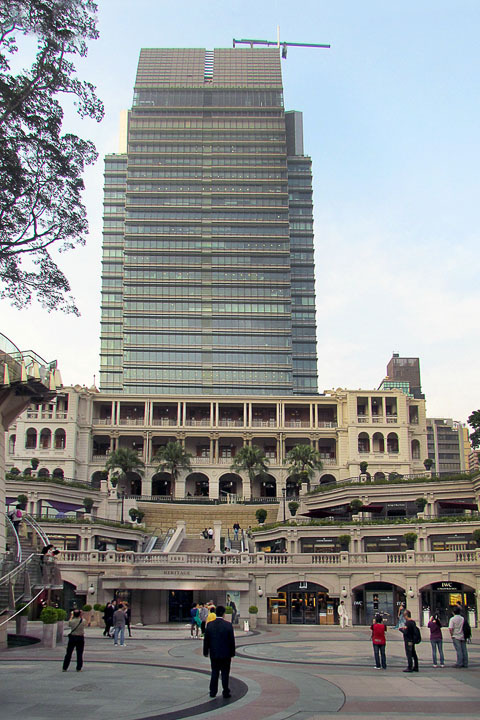 Renovation rather than high rise replacement is a hopeful sign for residents. 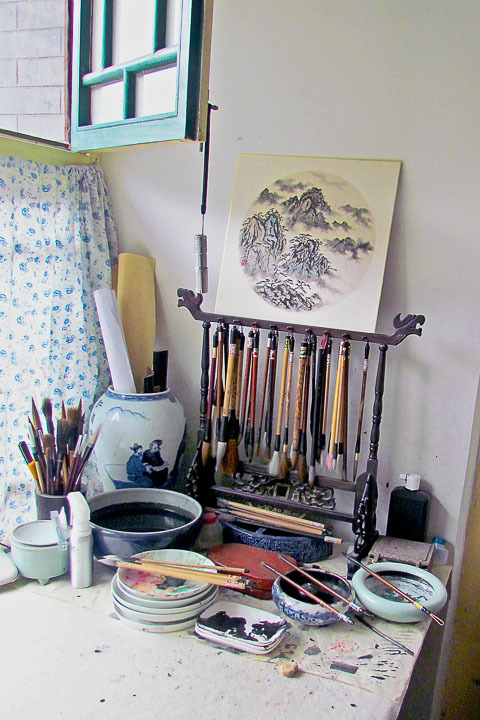 A visit to the hutong studio of an artist and calligrapher. 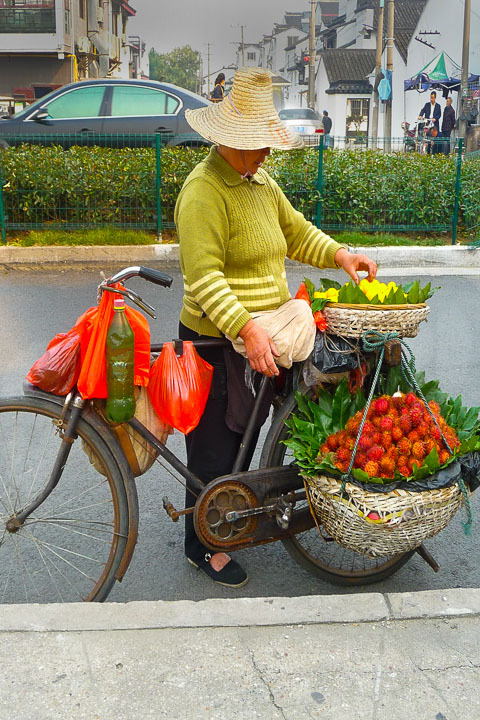 She makes an easy crossing before Beijing rush hour traffic begins. 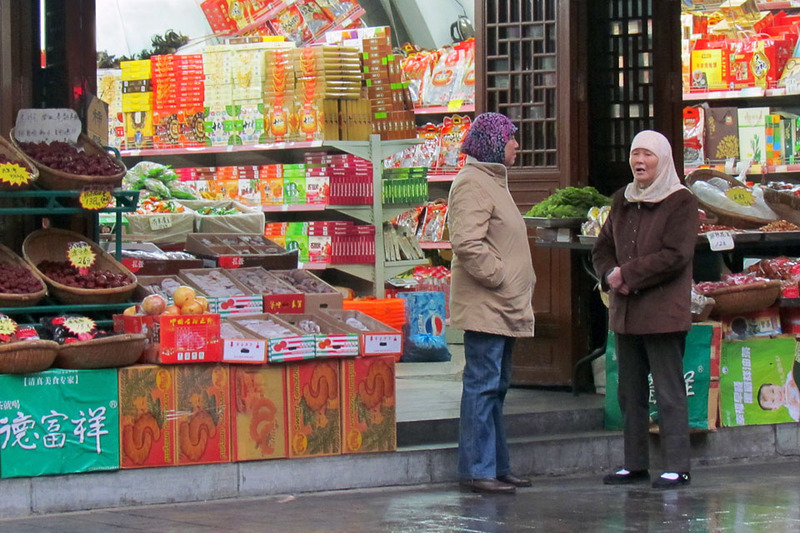 An early morning chat before customers arrive in Xian's Muslim Quarter. 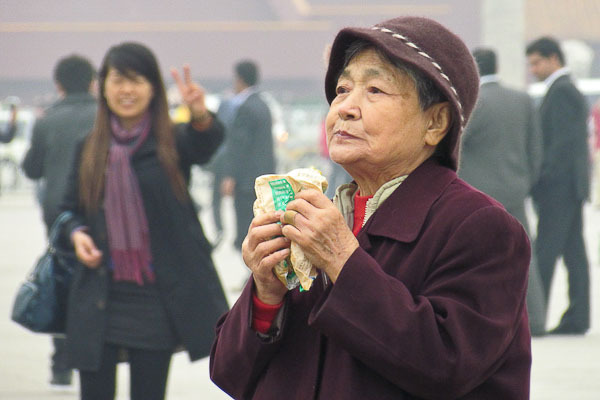 It recalls a past when rice was the major part of the Chinese diet. 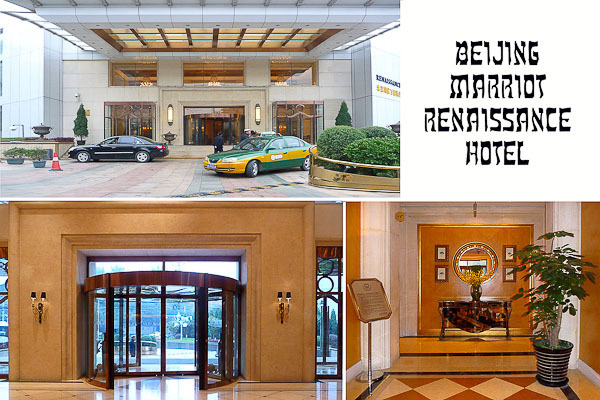 It resembles one of the grand boulevards of Paris. 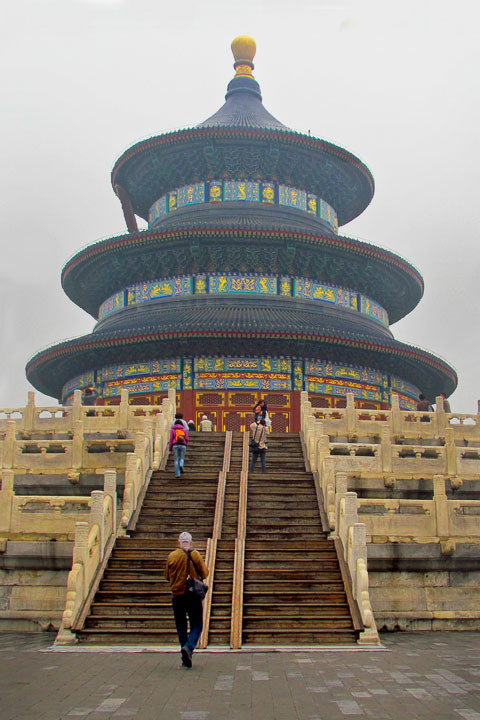 Built in the 14th century by Ming Dynasty Emperor Zhu Yuanzhang. 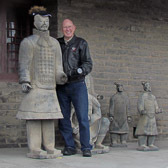 The hair hat wouldn't provide much protection for a warrior. 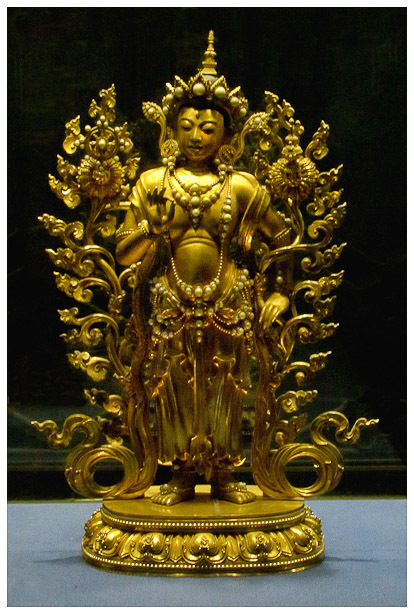 A gift to the Chinese from Johnson & Johnson at the Xian Museum. 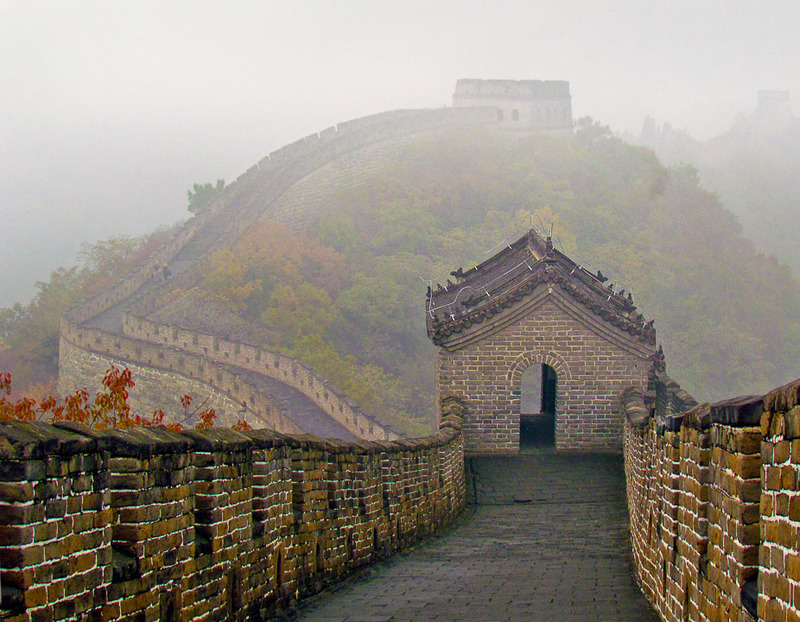 Another foggy day in China so don't see much of the Great Wall in the distance. 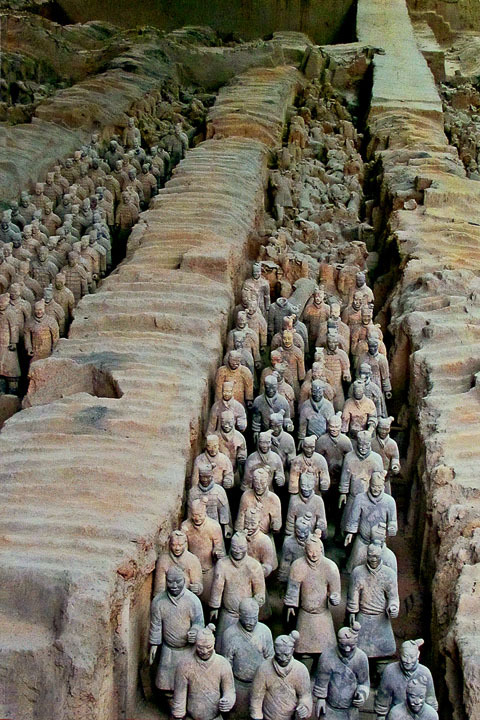 An army of about 8,000 that were buried at Emperor Qinshihuang's tomb. 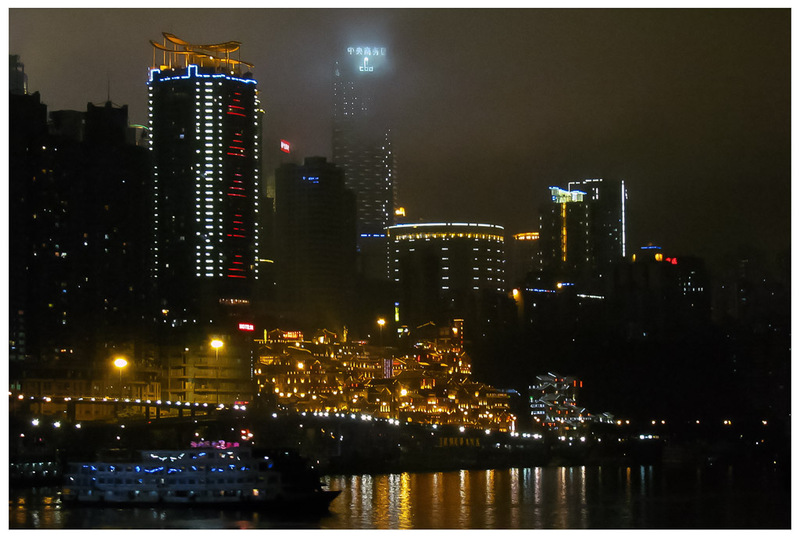 A sparkling display of city lights as we depart for a Yangtze cruise. 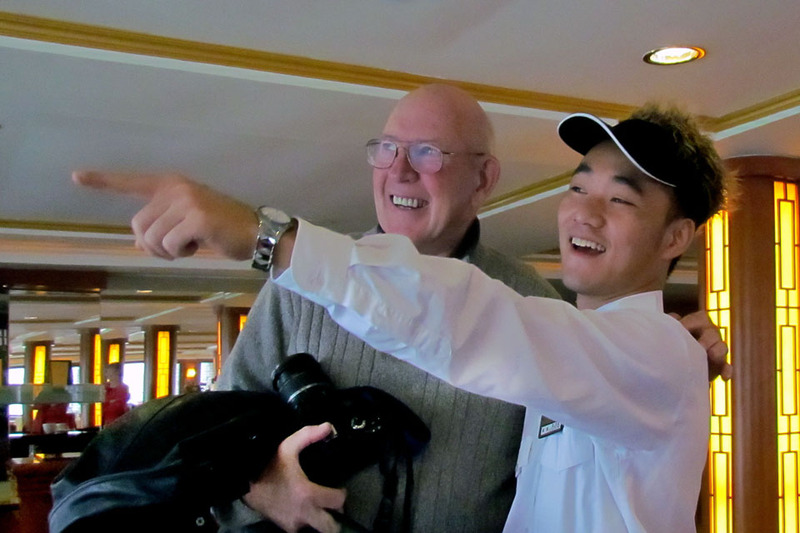 A friendly waiter enjoys wearing the hat as he points out sights of interest. 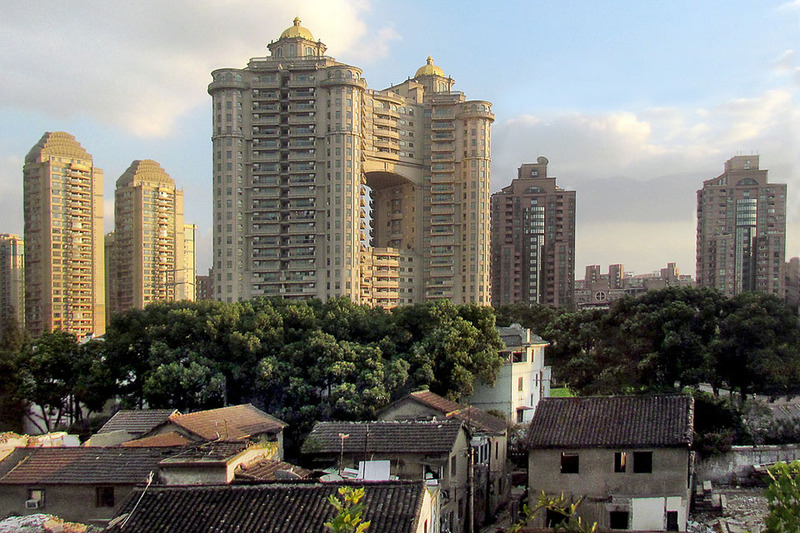 Homes and high rises now sit where there used to be farmland. 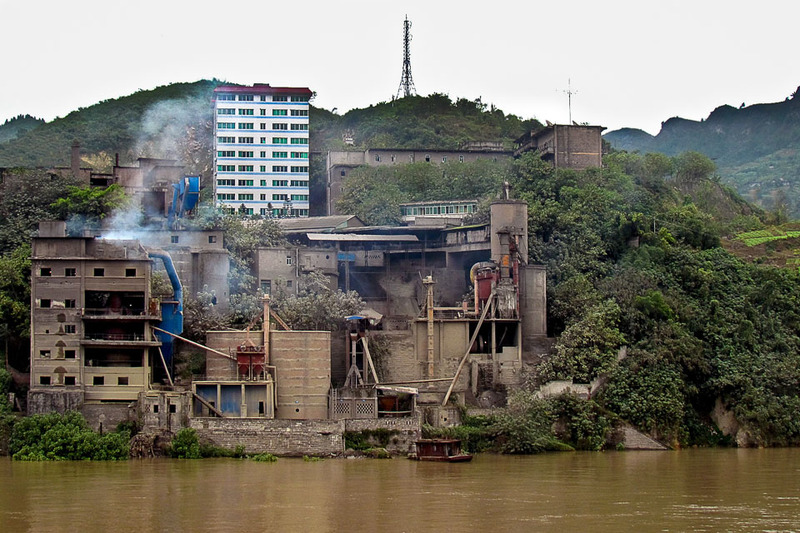 Factories spew smoke and exhaust upon neighboring residences. 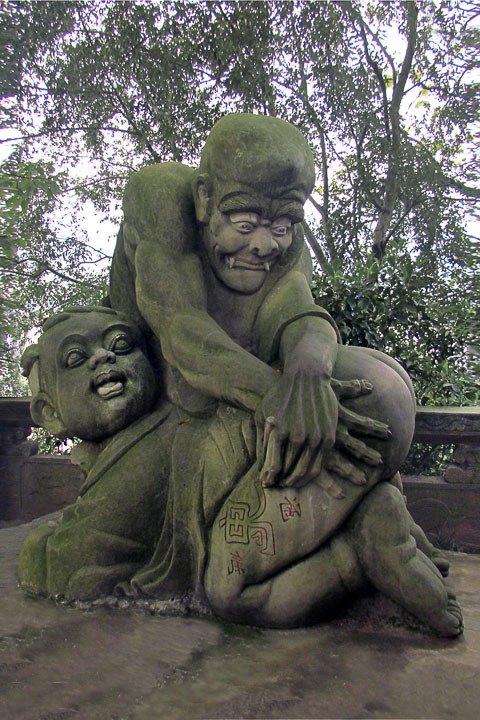 An statue at the Red Pagoda. Check out the tattoo tool in his hand. 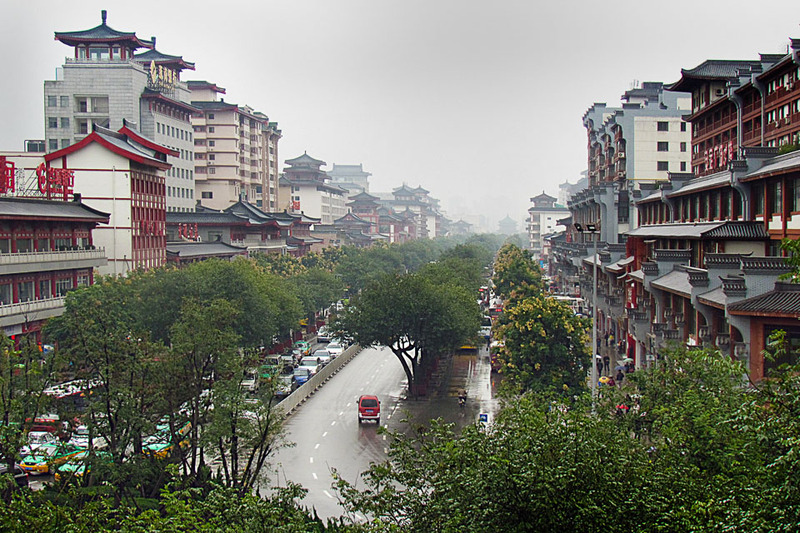 A 12 story temple built in the 1800's by Emperor Qianlong rises 100 ft. above the Yangtze. 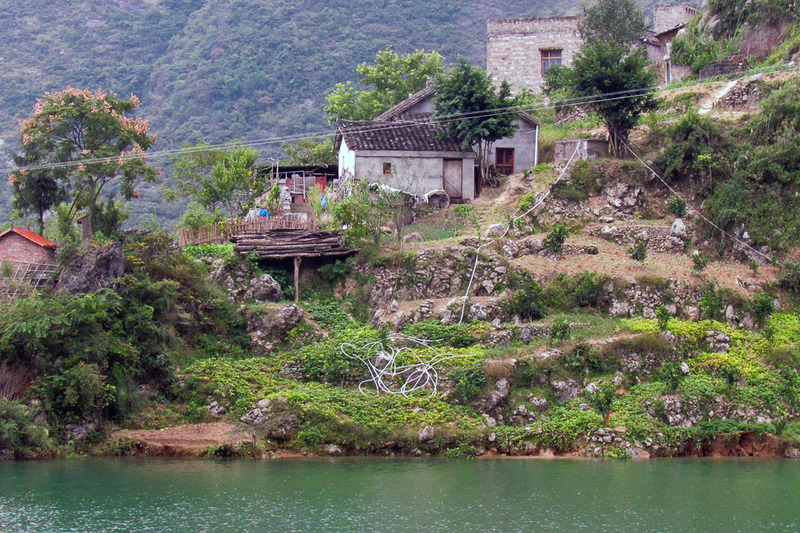 We see many isolated homes that are not yet a part of modern China. 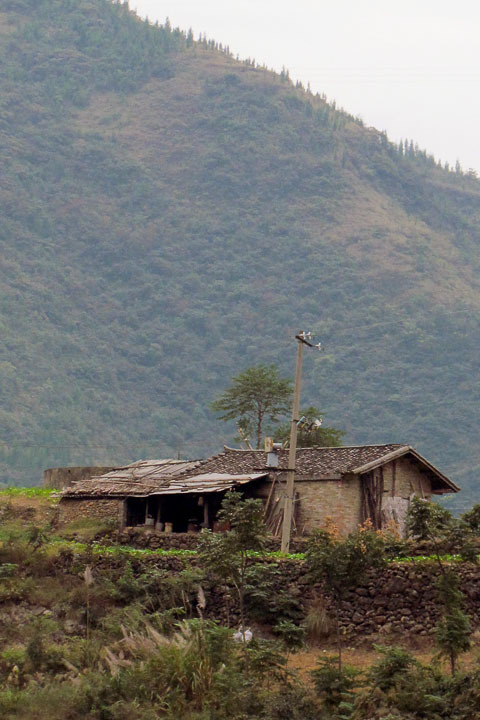 This home provides more living space than most China high rises. 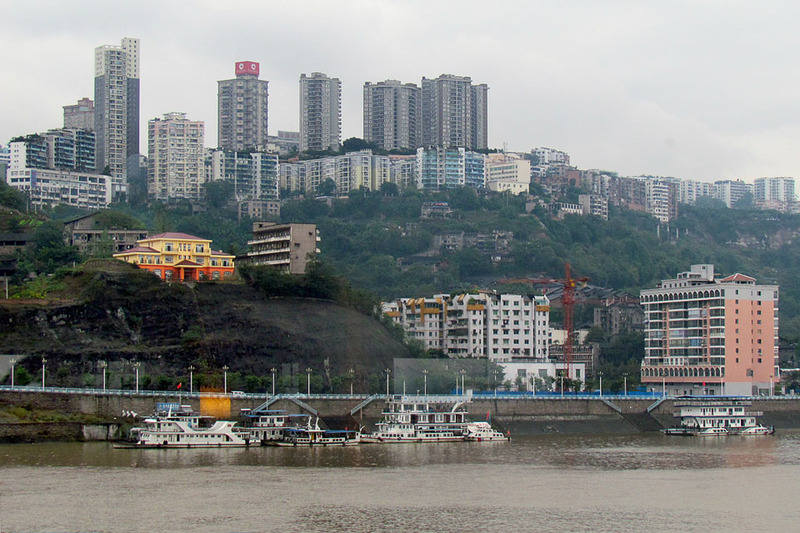 We also see vast urbanization with many high rises along the Yangtze. 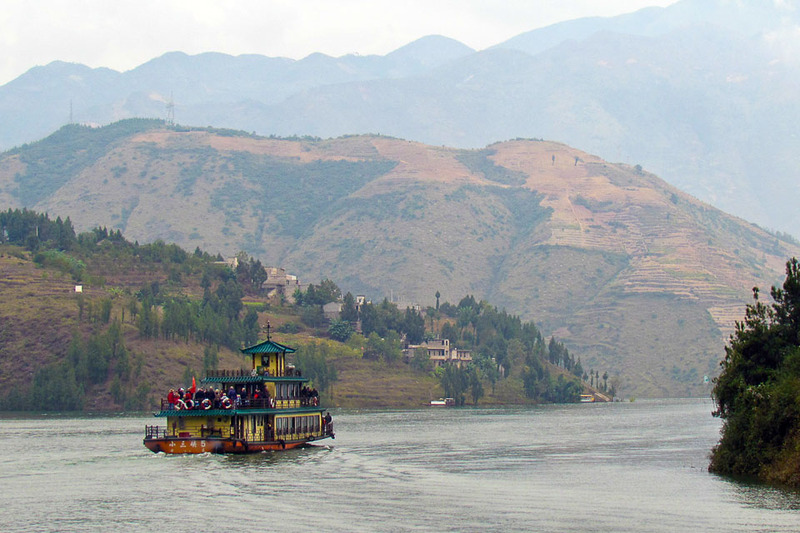 Smaller boats are used to enter the Lesser Gorges on the Daning River. 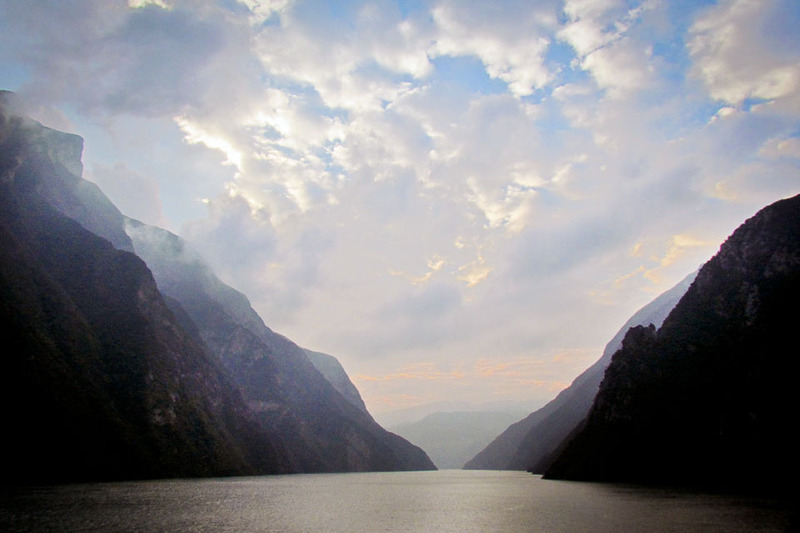 An impressive engineering feat also poses big ecological problems. Another amused reaction as he removes his hat to expose a very bald head. 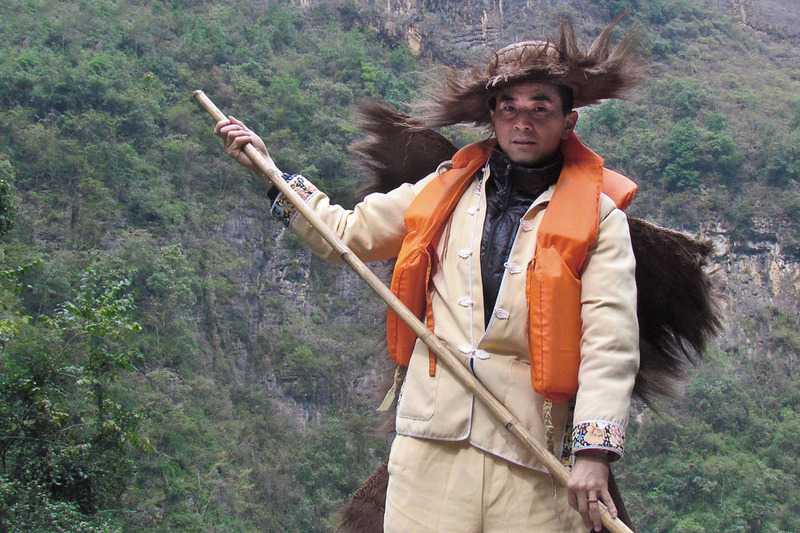 He uses a bamboo pole to push us further down river on an even smaller boat. 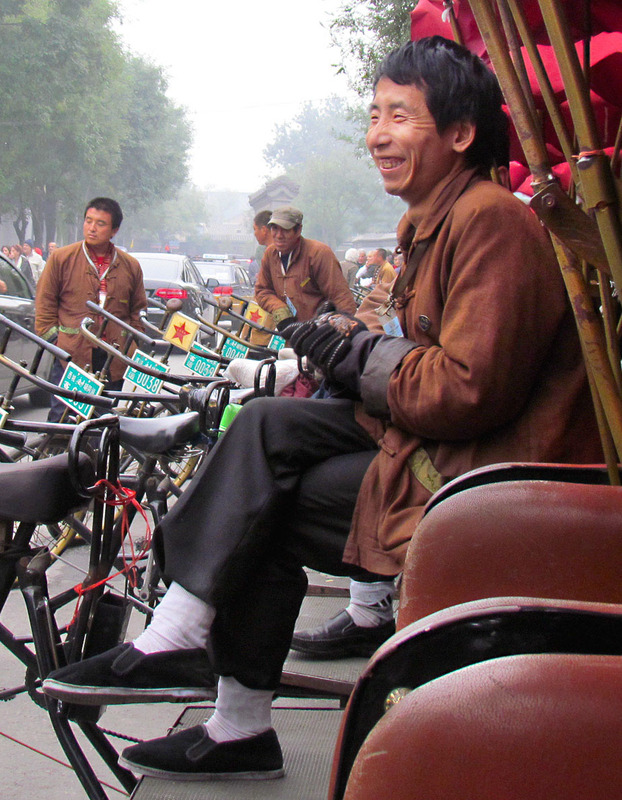 The shoe shine man was shy and silent until the hat came off. This morning there is a rare hint of blue sky but it didn't last for very long. 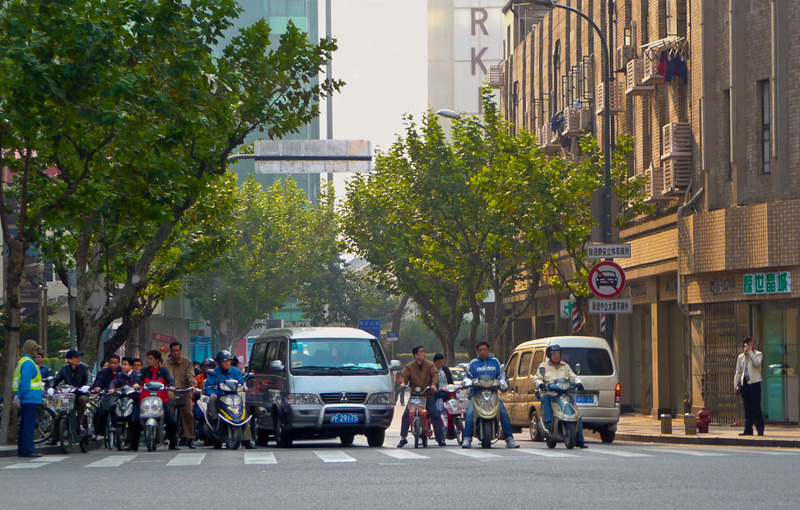 Few helmets are worn dispite dense traffic and erratic Chinese driving. 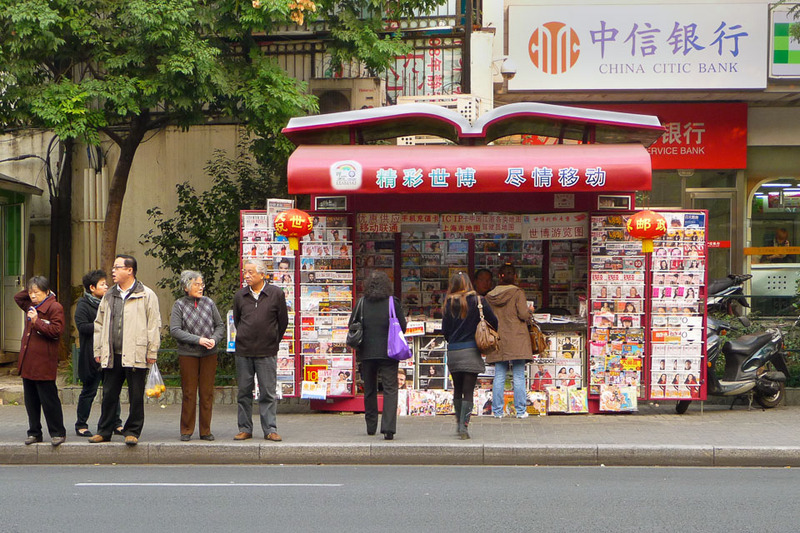 A Shanghai bus stop is much more crowded during rush hours. 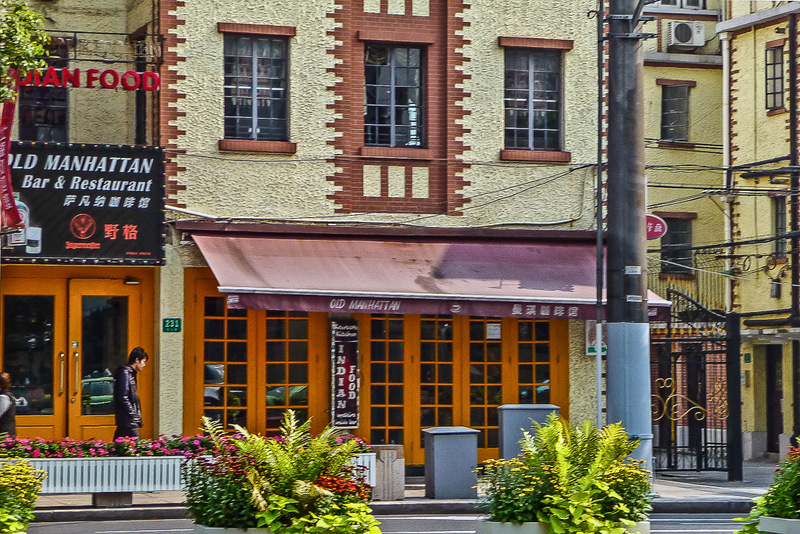 Being from New York, we are glad to see the Old Manhattan Restaurant. 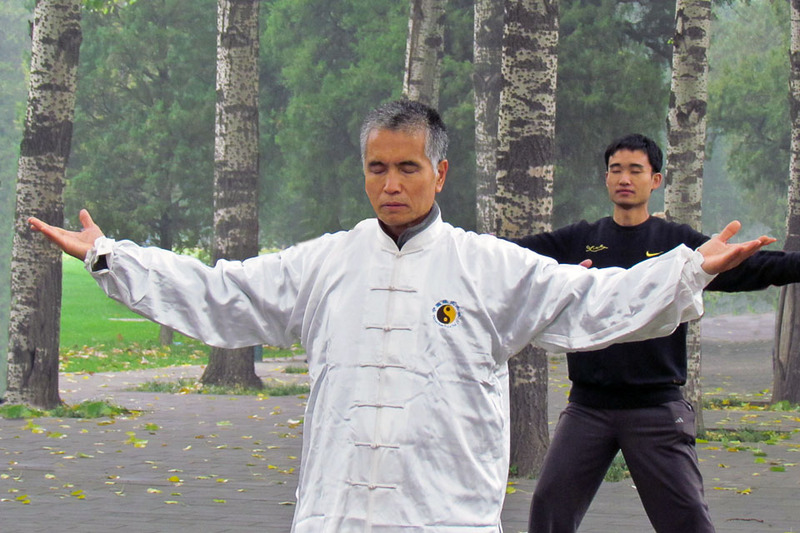 Chinese exercises can help promote peace of mind for practicioners. 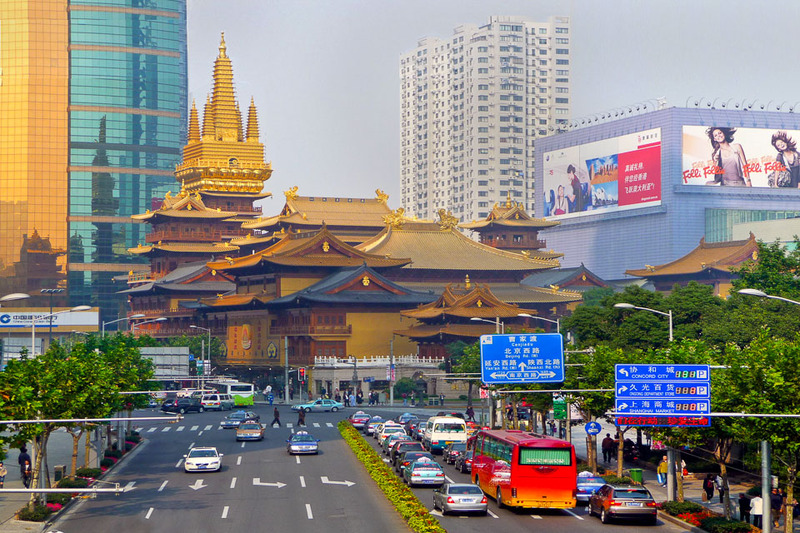 This huge temple in Shanghai encompasses an entire city block. 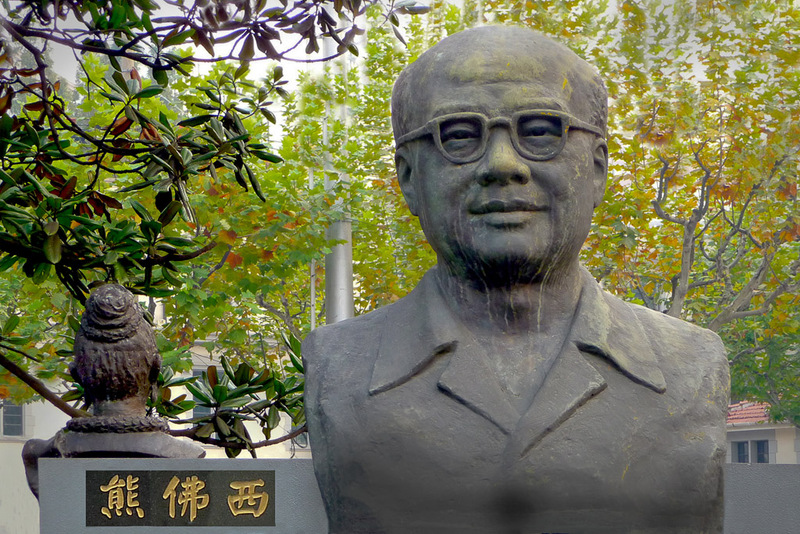 A statue of China's famous playwright at the Shanghai Theater Academy. 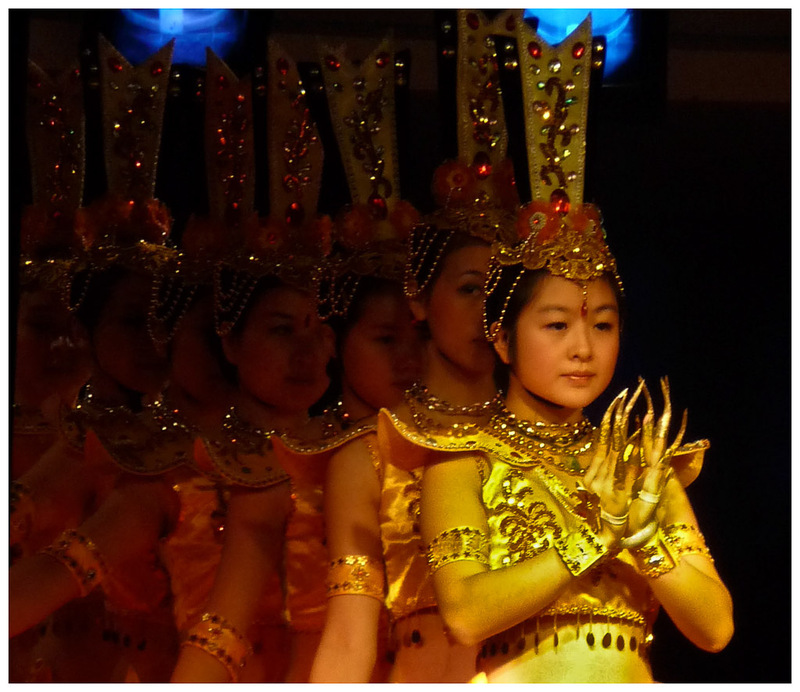 Talented dancers by night and hotel housekeepers during the day. 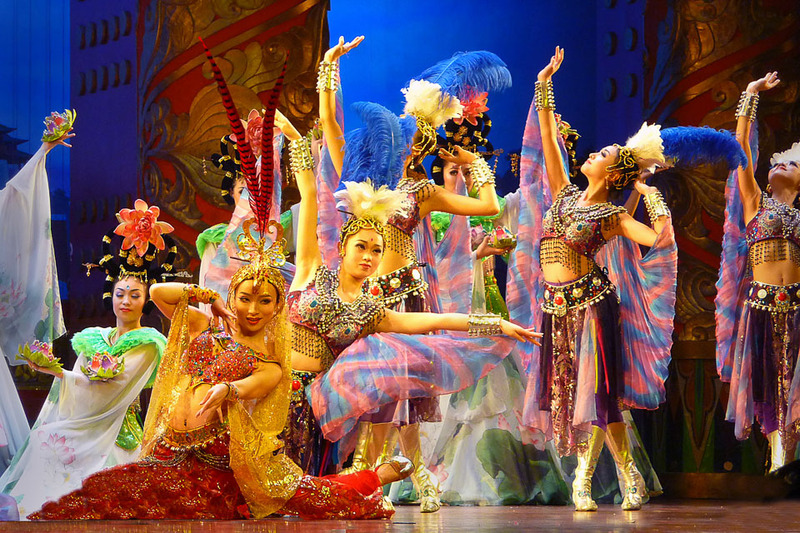 The Tang Dynasty Show is a reminder of an ancient stable and prosperous society. 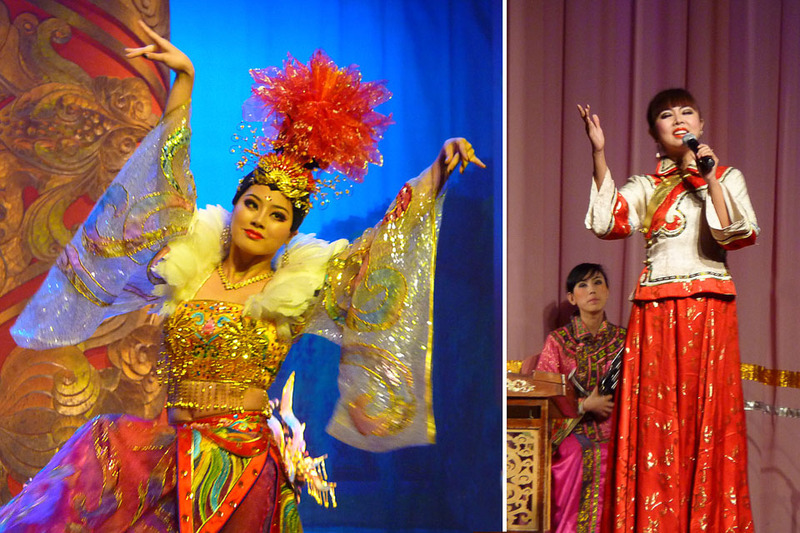 The Tang Dynasty Dinner Theater recalls a time long ago in China's history. 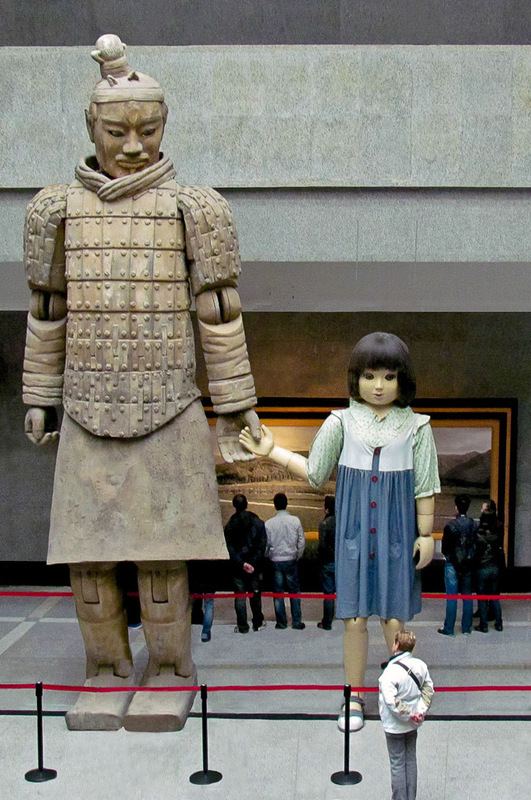 The Tang Dynasty show offers insight into the culture and life style of the period. 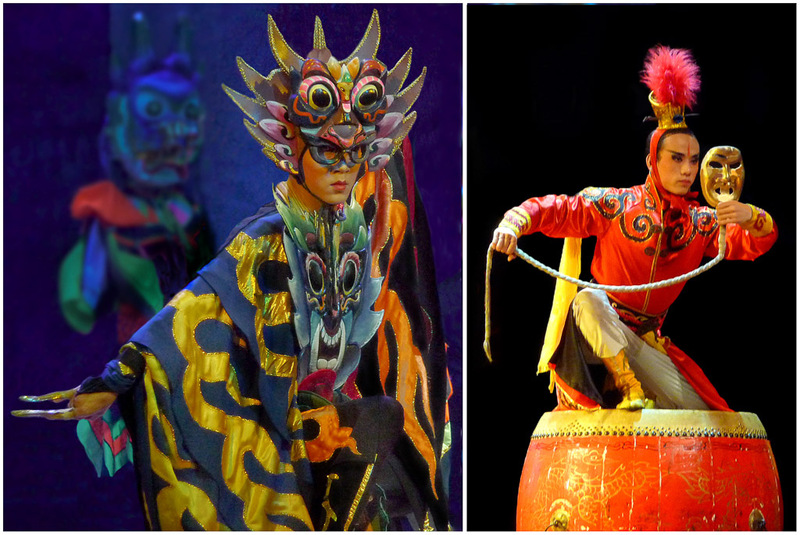 A dazzling display of daring, balance and energy with a touch of comedy. 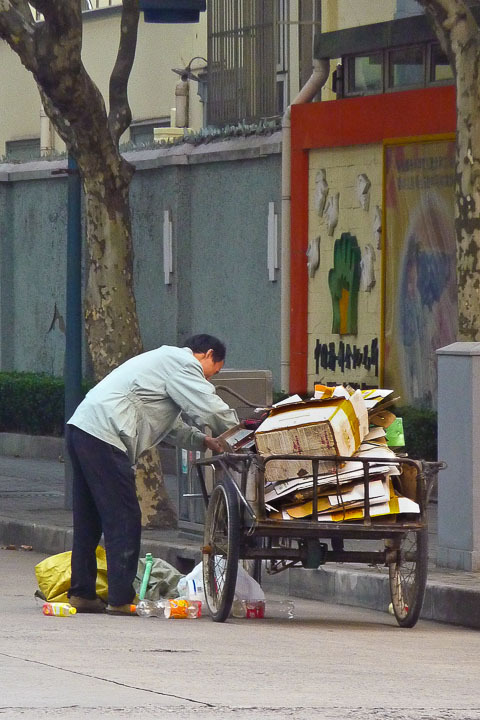 How we saw garbage collection done in the cities that we visited. This young lady is very puzzled as she stares at the hair hat. 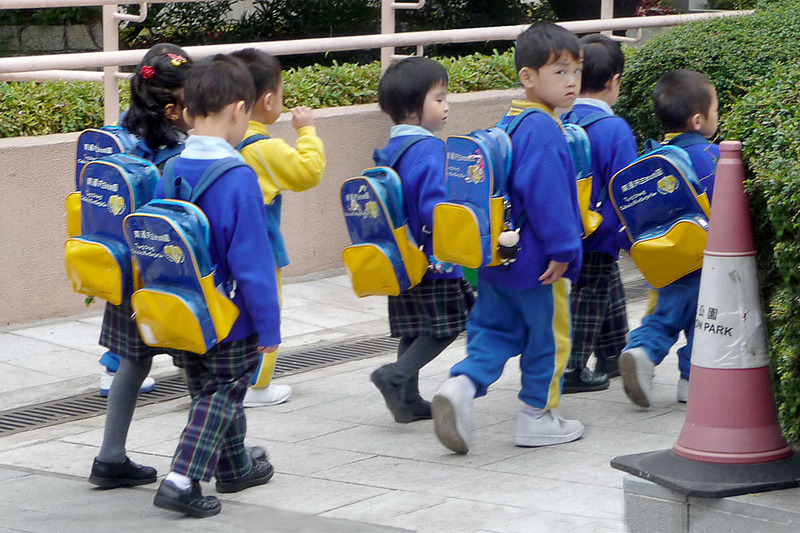 We rarely saw young people on weekdays. They were at school or studying. 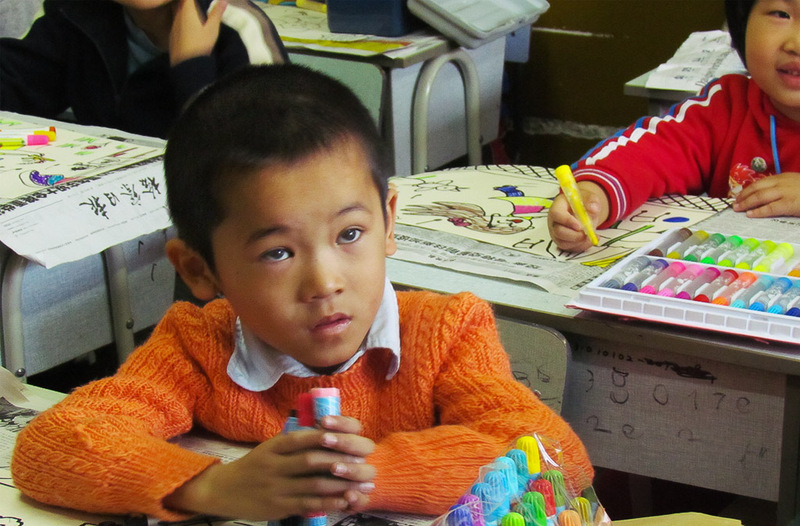 A visit to a Shanghai school where this student tries to figure out the hat. 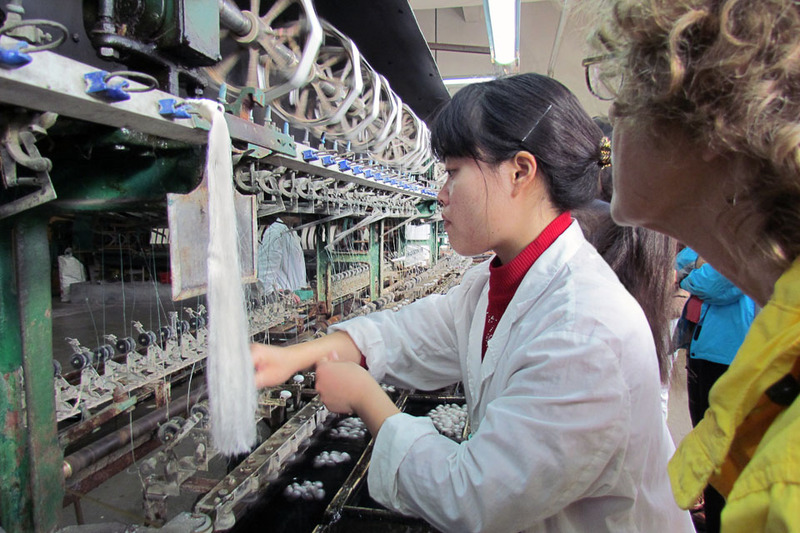 We get an up close look at the art of weaving fine Chinese silk. 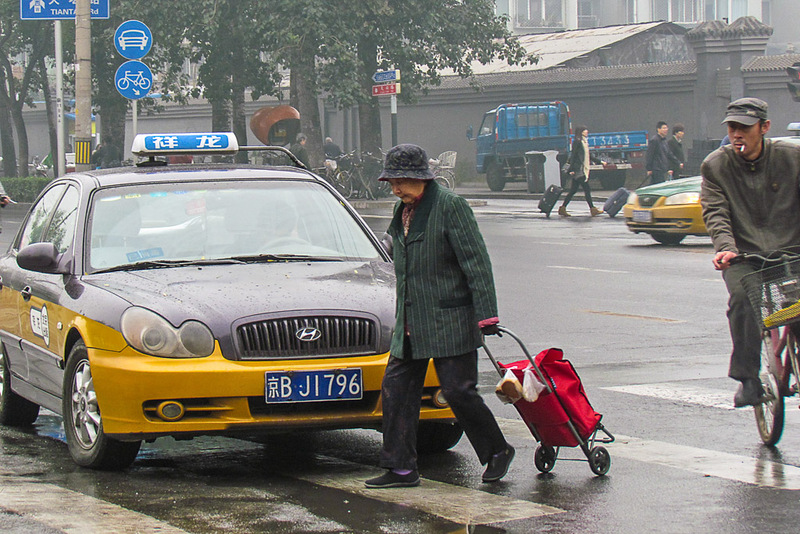 Even the side streets of Shanghai are jammed with traffic. 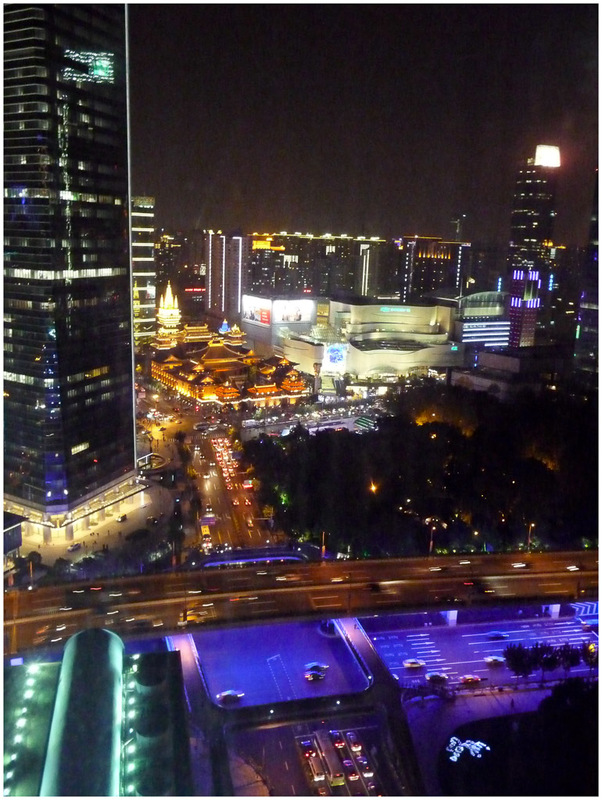 Shanghai seemed to us to be like Las Vegas on steroids. The old neighborhood will soon be replaced by more high rises. 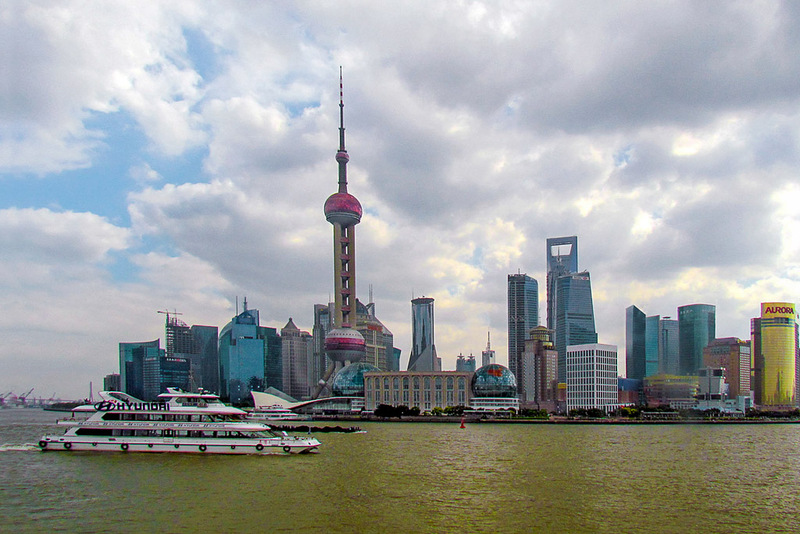 Looking across the the Huangpu River to a very modern part of Shanghai. 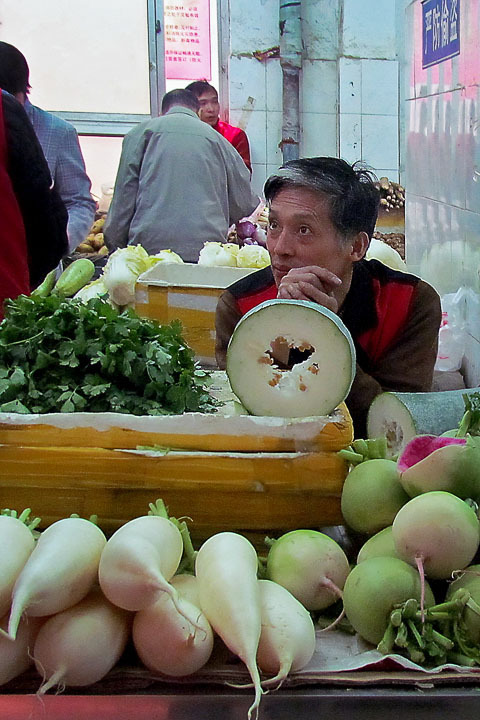 The market by the YuYuan Gardens is wall to wall people on a Sunday. 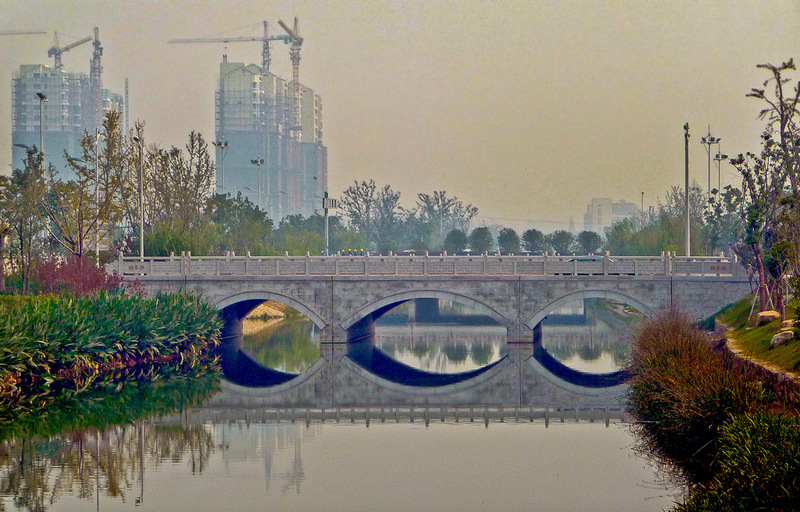 Suzhou is the ancestral home of I.M. 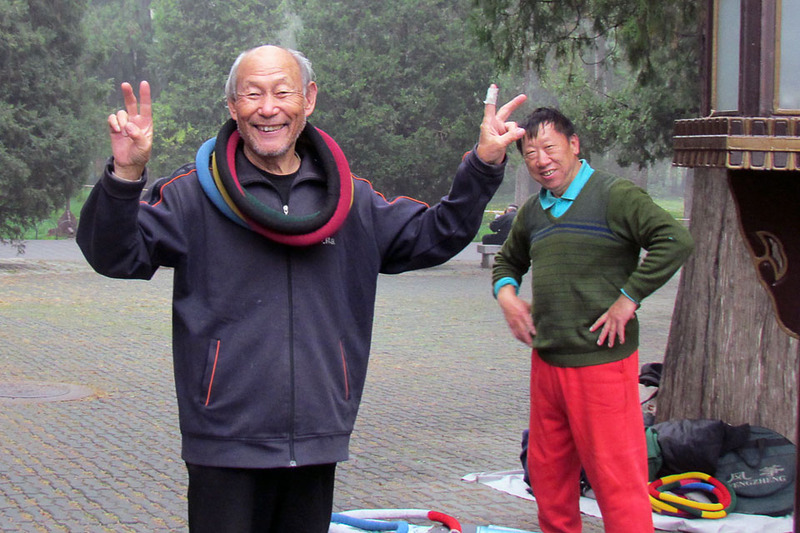 Pei with a museum in his name. 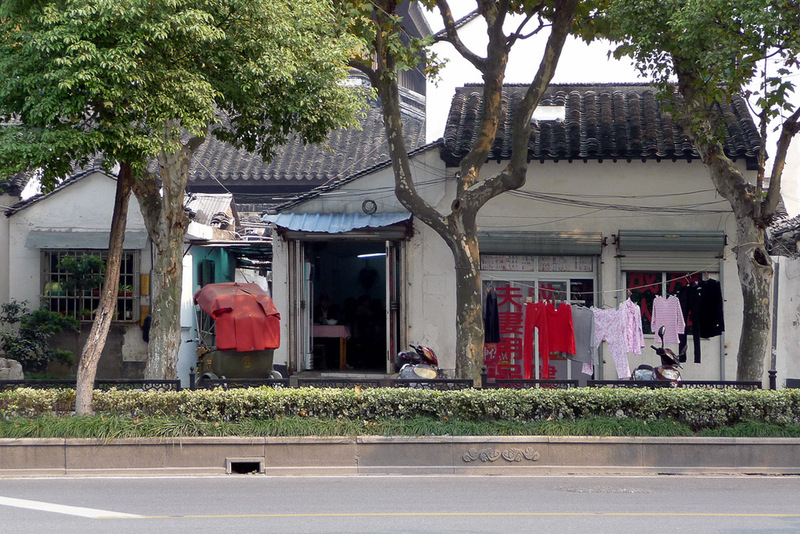 We walk the main road from the train station into Suzhou's busy city center. 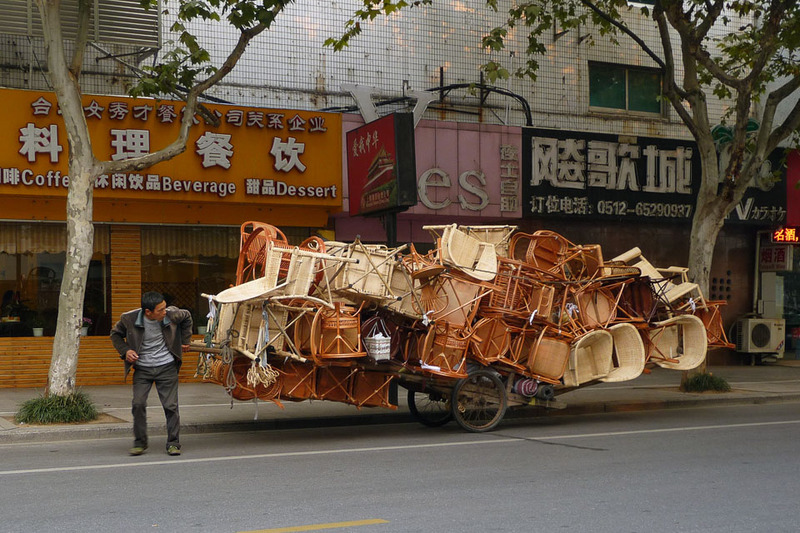 Any vehicle we saw being used to transport goods was always overloaded. 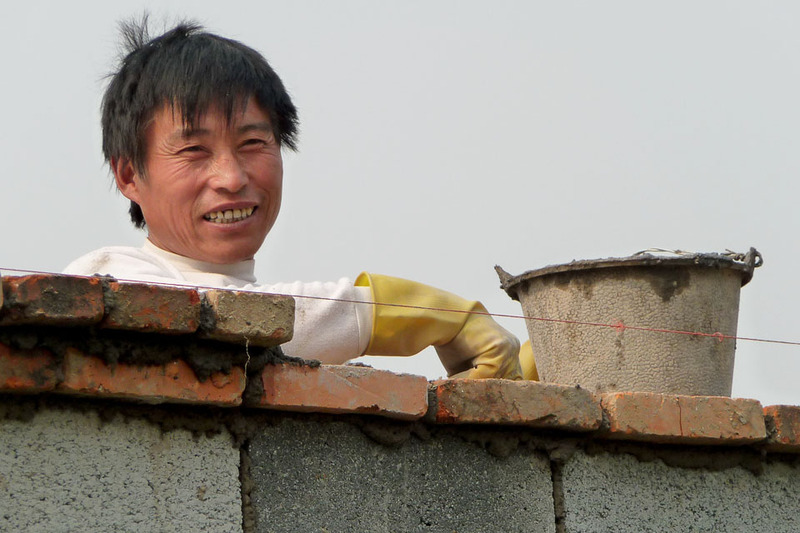 The brick layer has a laugh at hat hair and flashes us a big smile. 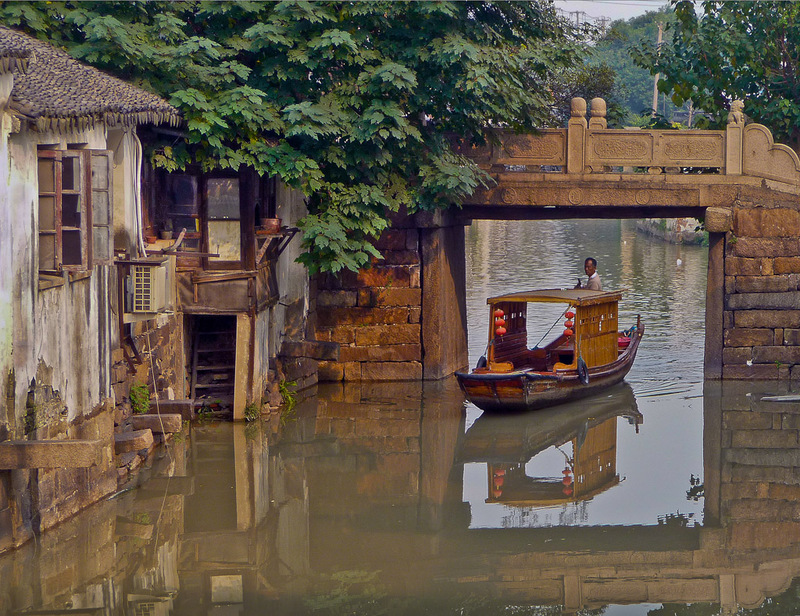 Canal boats transport passengers up and down Suzhou's canals. 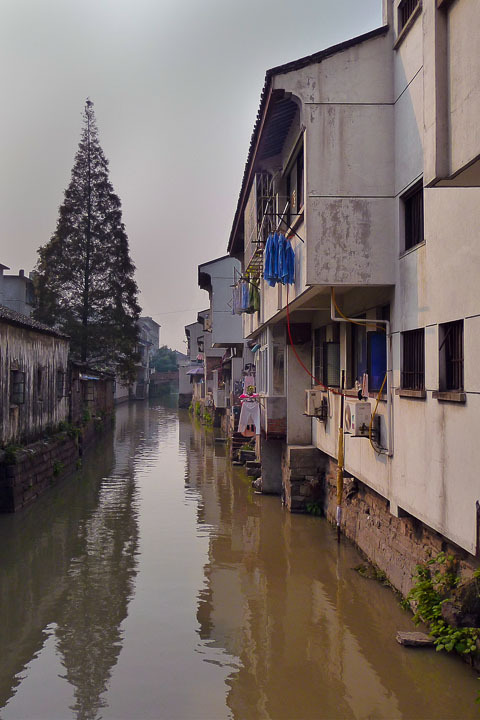 Suzhou with it's canals is described as the Venice of the East. 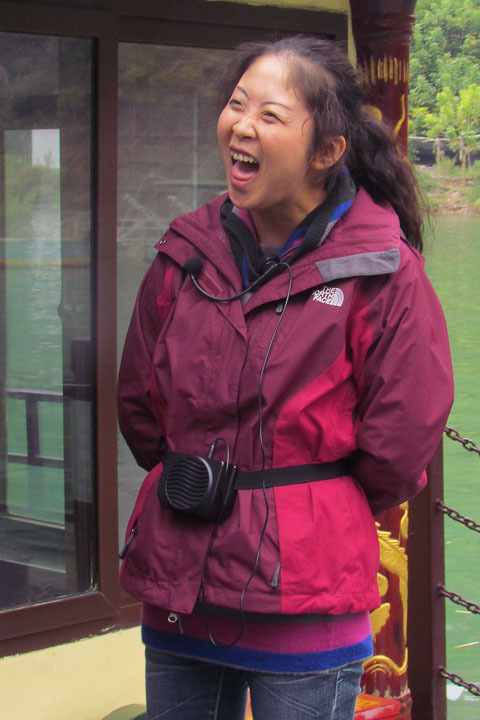 One of Suzhou's many street vendors offered us a taste of her lychees. 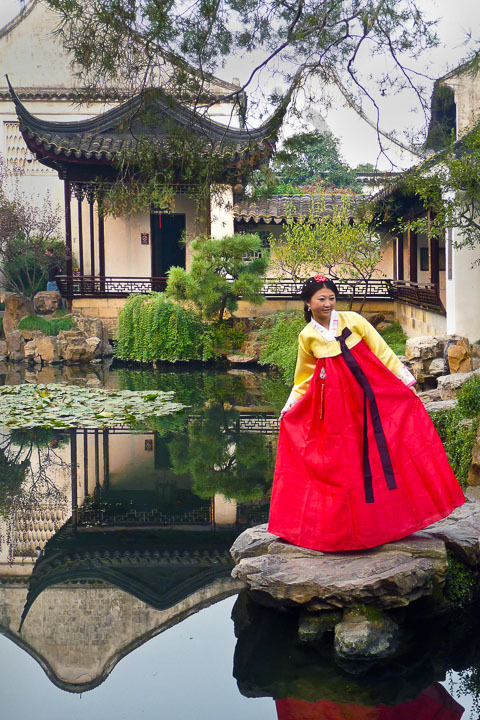 The bride poses at the Master of the Nets Dragon Gardens built over 800 yrs. ago. 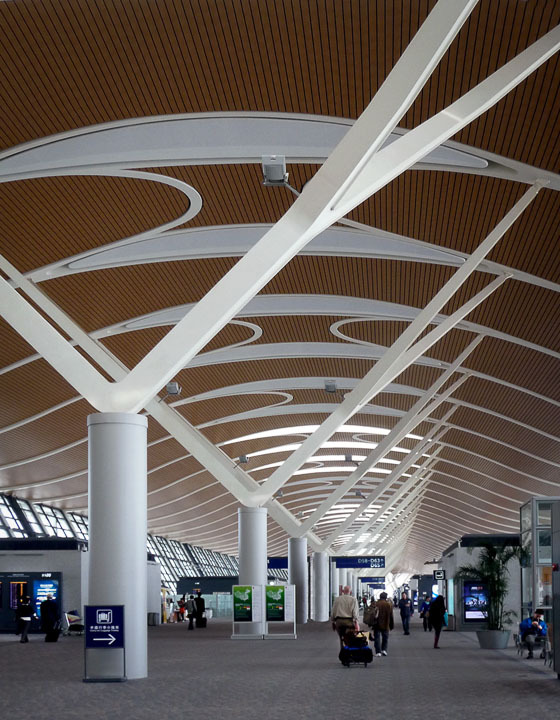 Shanghai Airport is not busy yet as we come to catch a plane to Hong Kong. 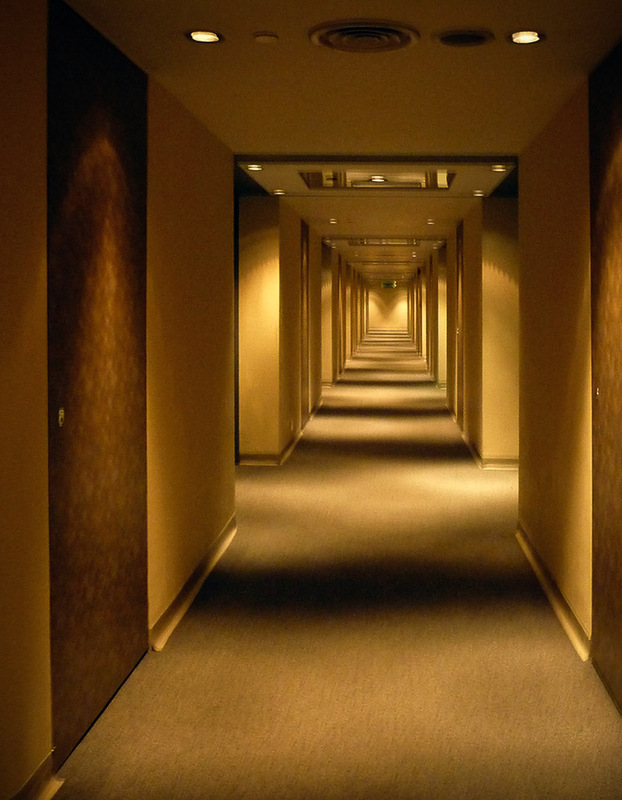 The hallway in Hong Kong's Prudential Hotel casts an eerie spell. 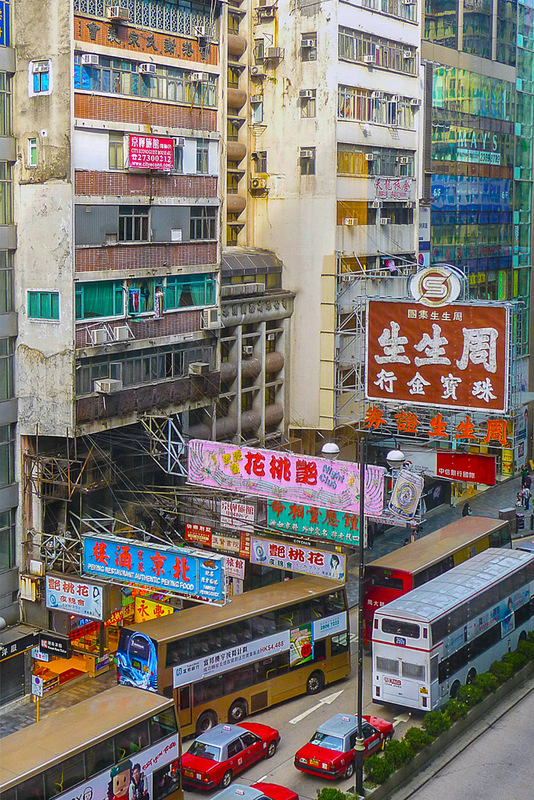 The view from our hotel window of the very busy street below. 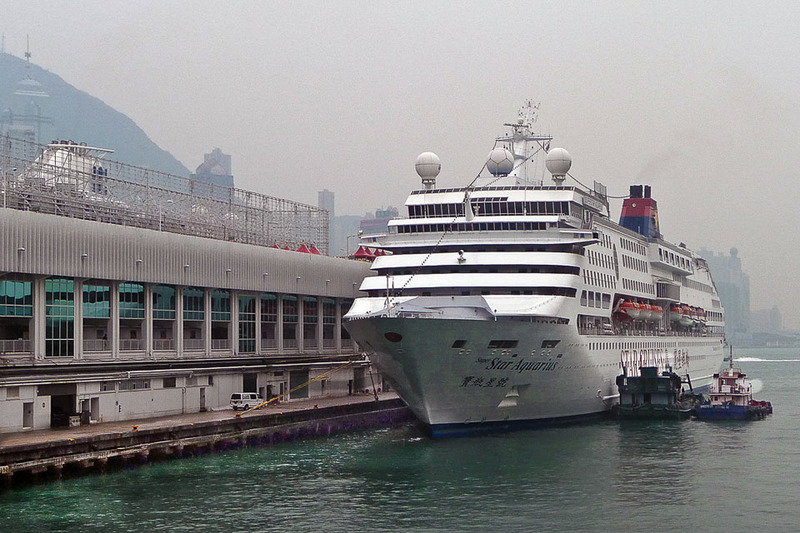 Cruise ships wait at the dock while passengers go Hong Kong shopping. 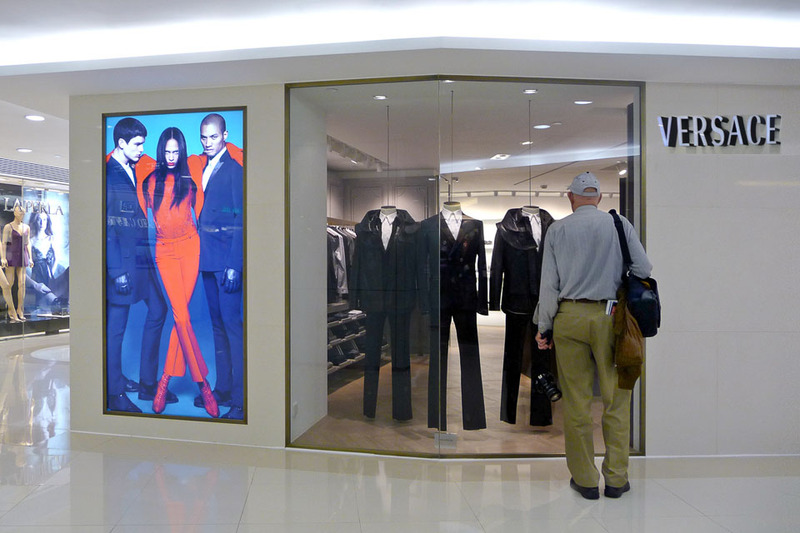 A maze of big name stores where some shoppers come with body guards. 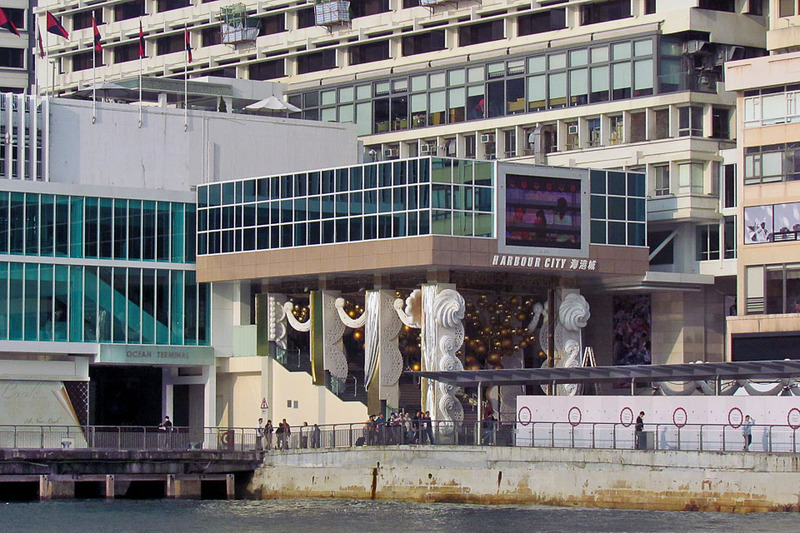 Be sure to bring a fat wallet if you plan to shop at this upscale mall. 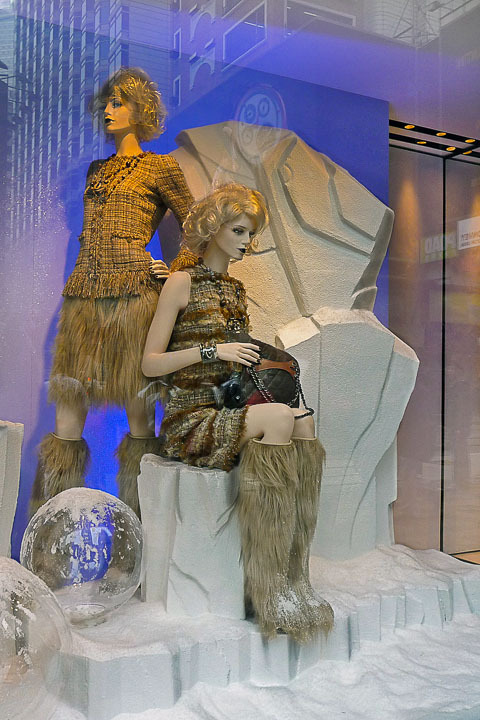 Coco would be amazed to see her brand in so many Hong Stores with her name. 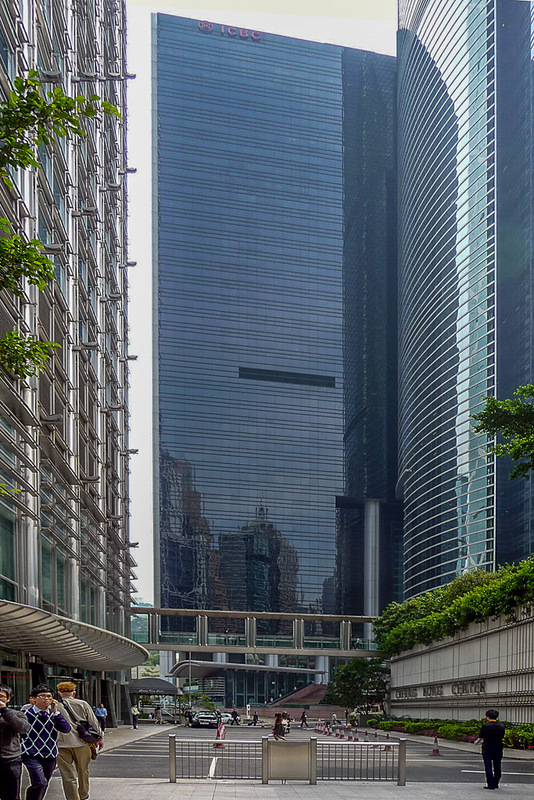 One of the many modern buildings in Hong Kong's financial center. 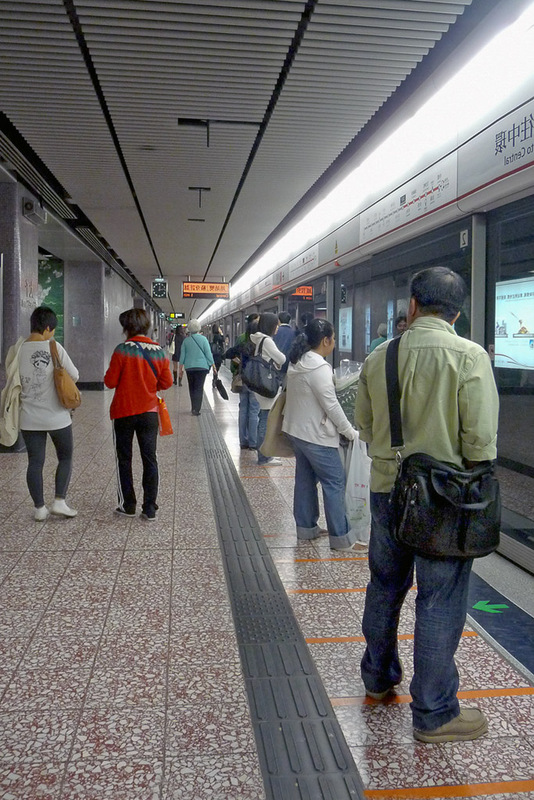 One of China's many modern, efficient and clean subway systems. 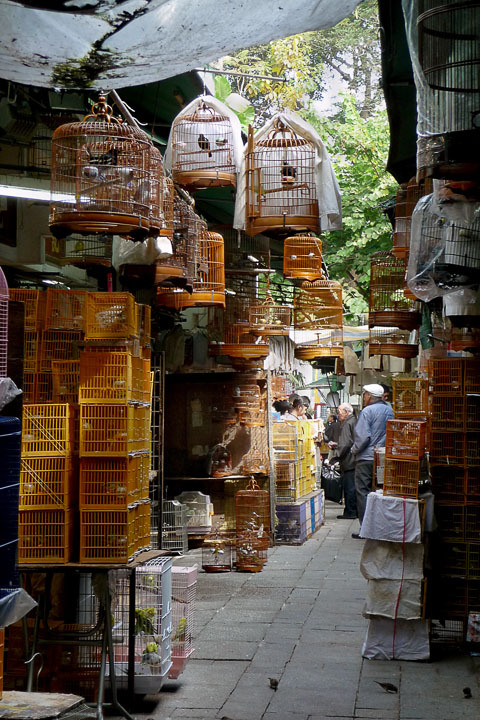 As we walk to Hong Kong Harbor we come across the busy bird market. 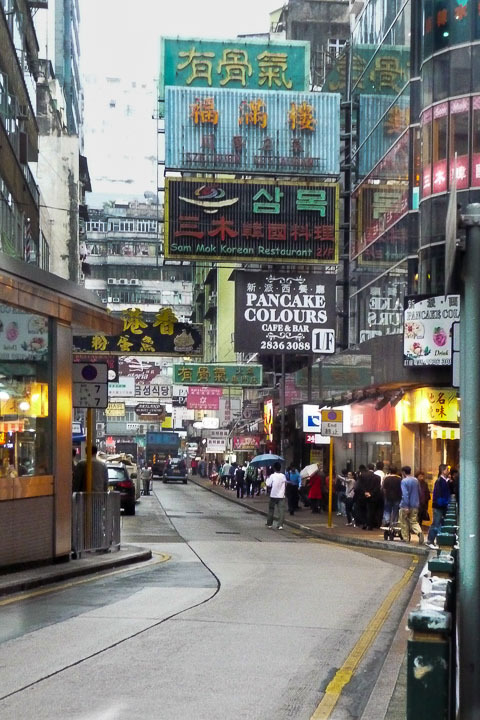 Your sure to find something that you'll want to eat on this street. 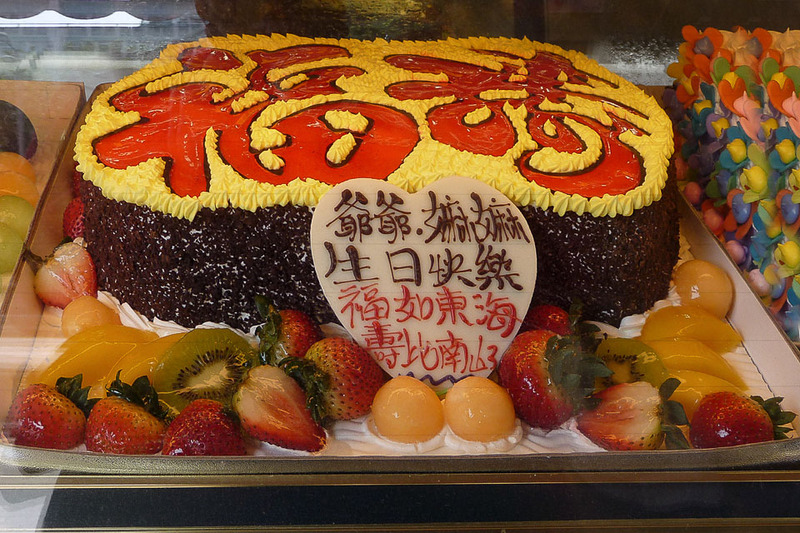 The cake wishes the grandparents good health and a long life. 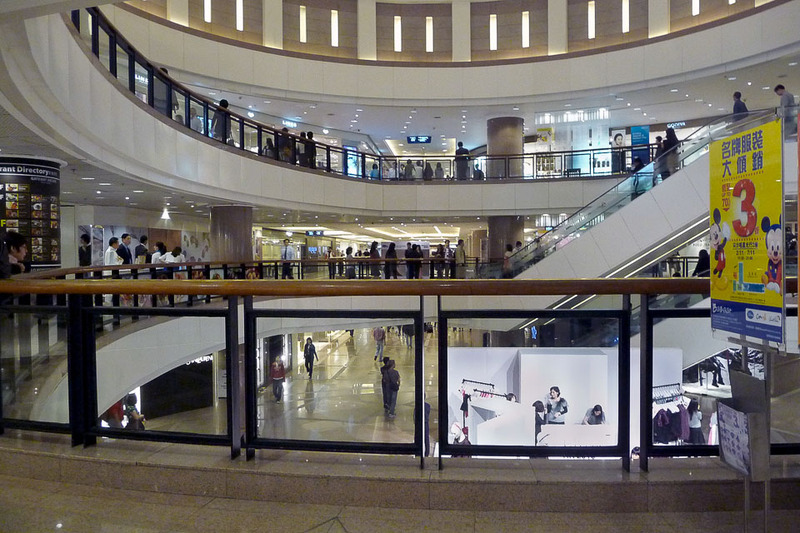 This mall offers affluent shoppers top fashion names from around the world. She enjoys the playground while the the children are busy at school. 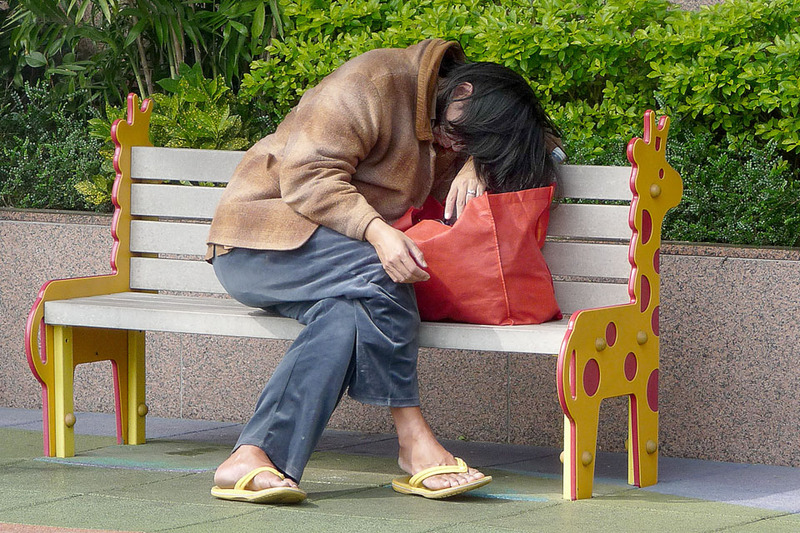 People in the big cities that we have visited always seem to be very tired. 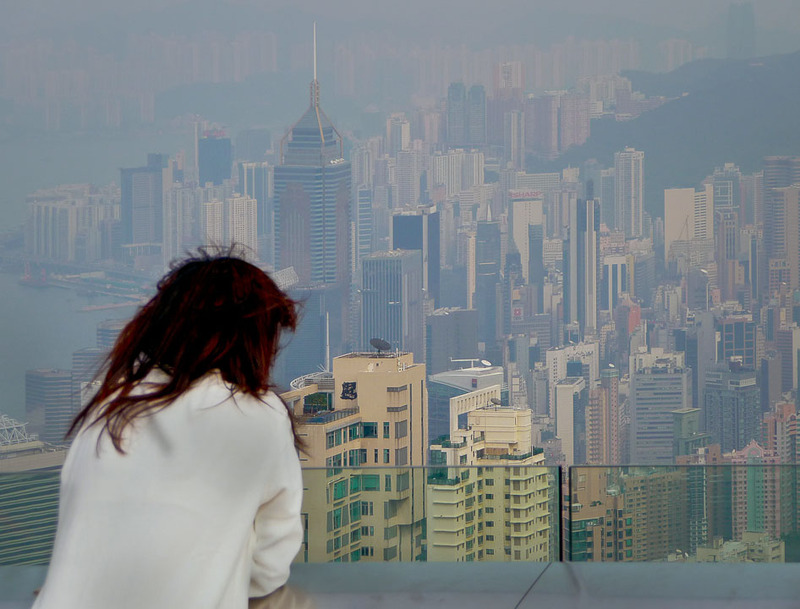 A view of Hong Kong from the observation deck at Victoria Peak. 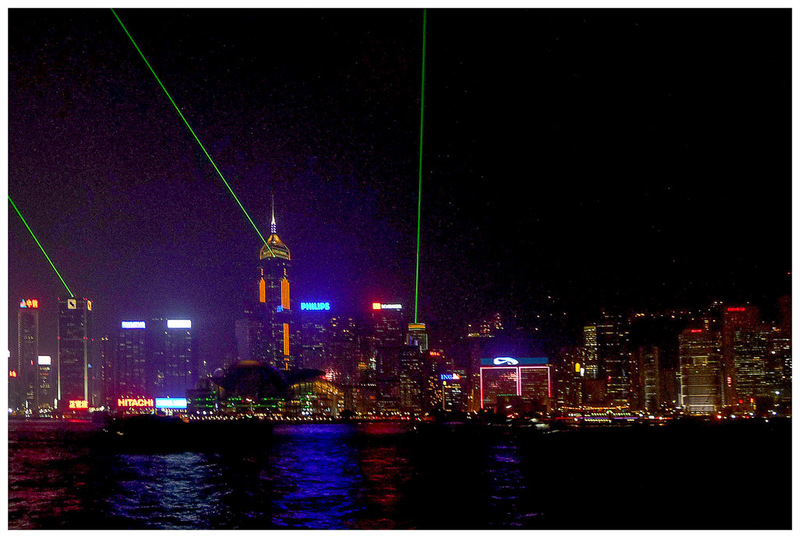 Every night there's a musical laser show along at the Hong Kong Harbor. 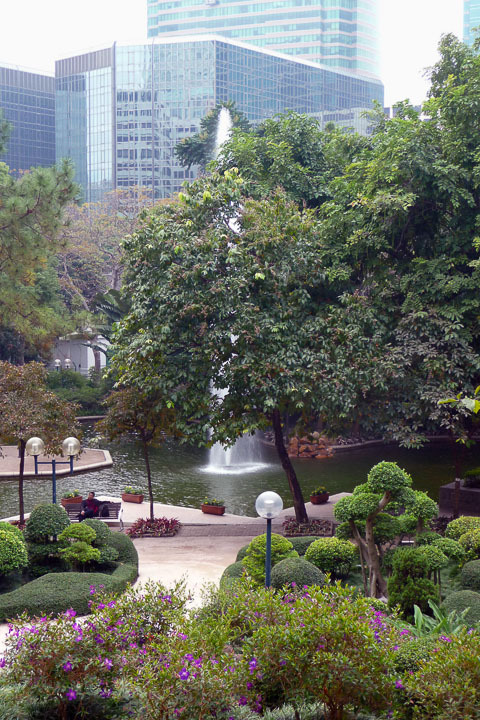 A beautiful oasis along Nathan Road on a walk to Hong Kong Harbor. 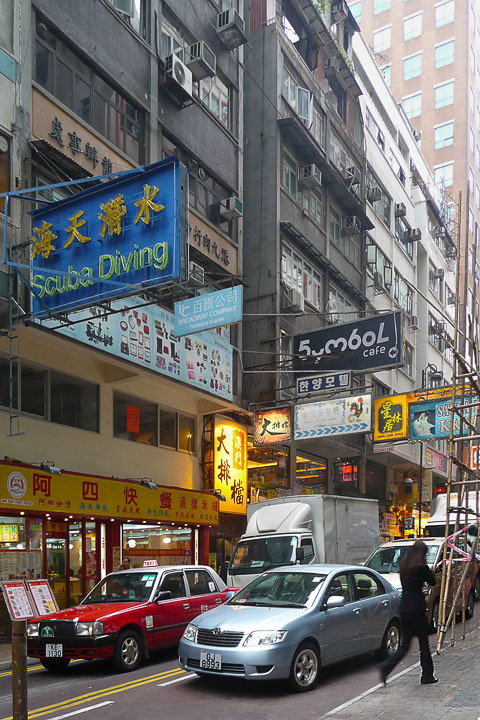 Some the the world's most expensive real estate is along Hong Kong's Salisbury Road. 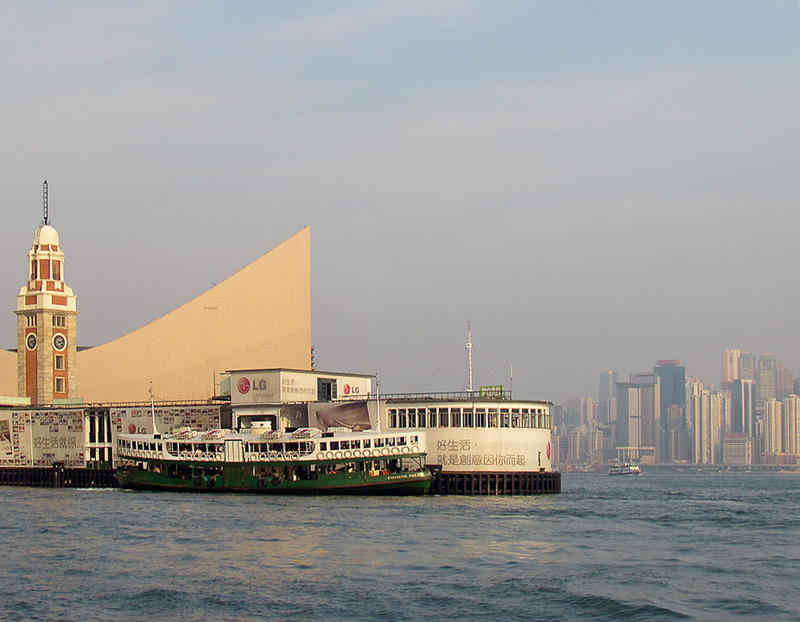 It speeds you across the river to Victoria Peak. 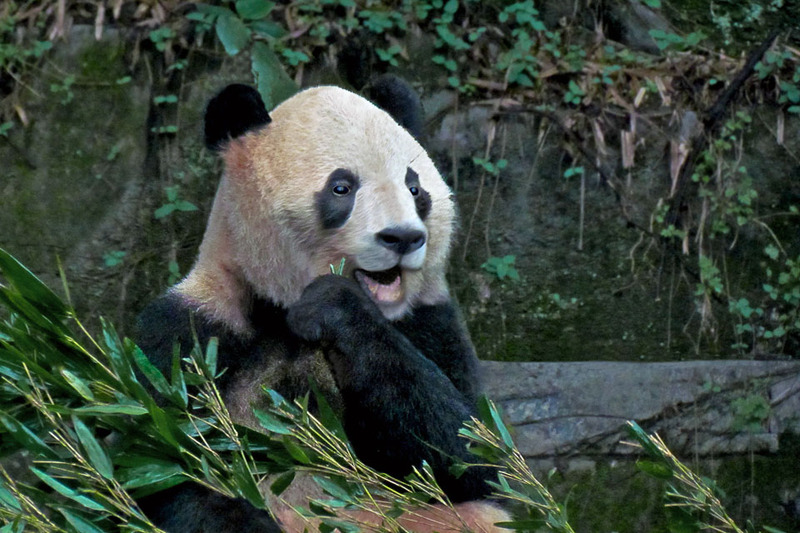 The pandas are oblivious to the many visitors who come to see them. 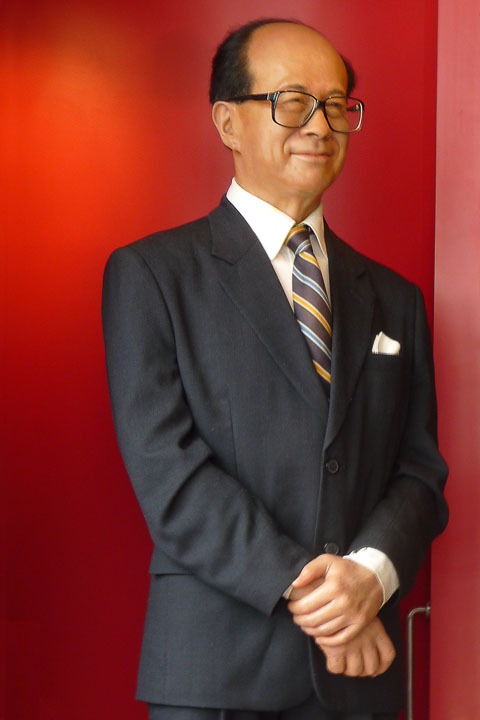 Businesman Li Ka-Shing cast in wax at Hong Kong's Madame Tussaud's. 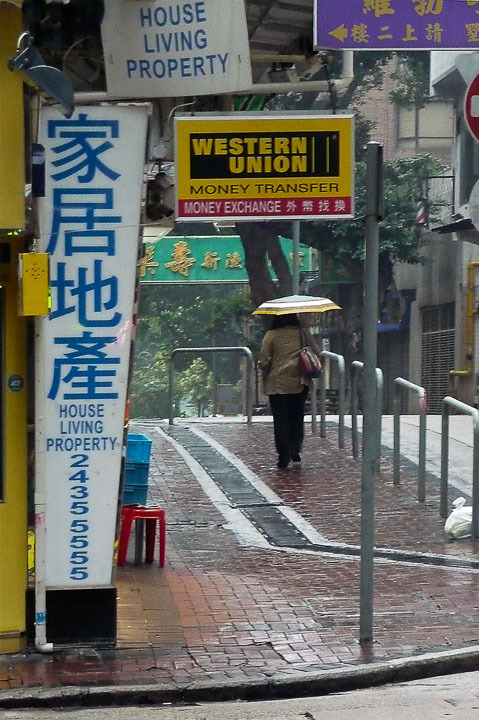 A rainy and chilly morning as we leave Hong Kong for the long trip home. 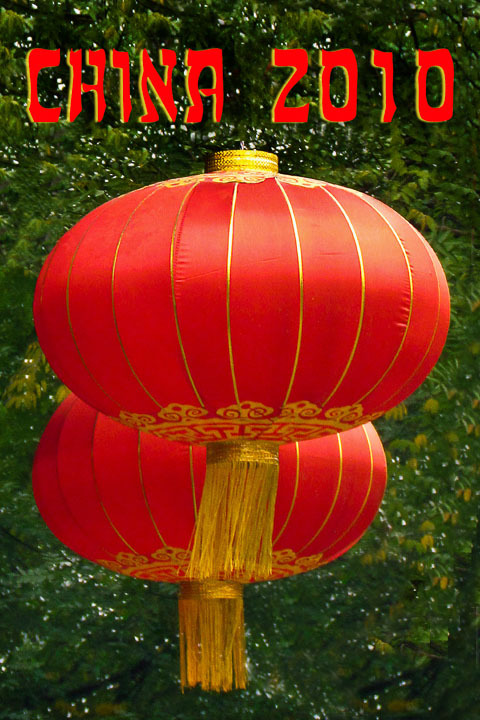 Red lanterns are seen all over China as a symbol of hope for the future.